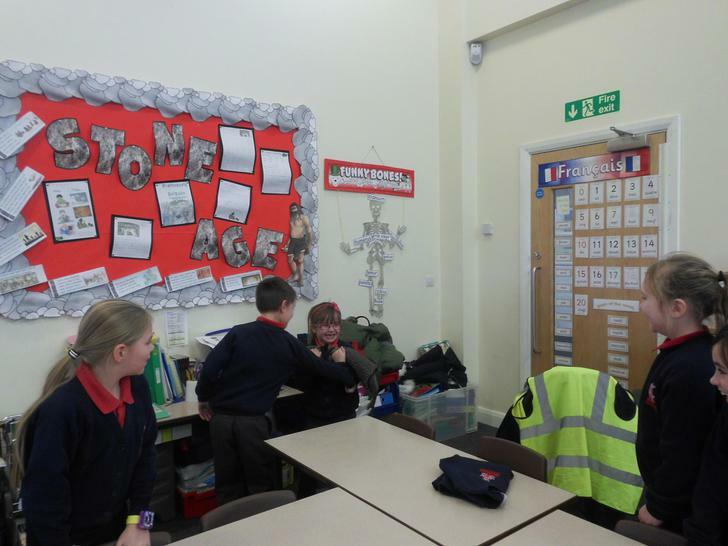 Welcome back to yet another week in Year 3. 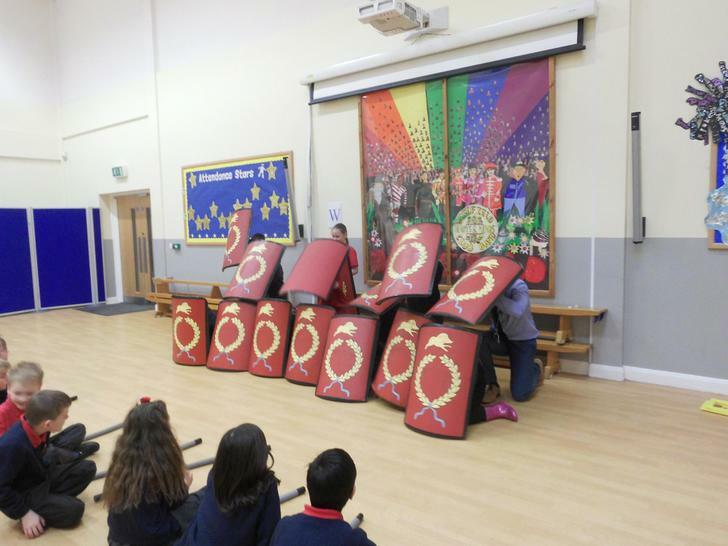 And another very, very busy week. 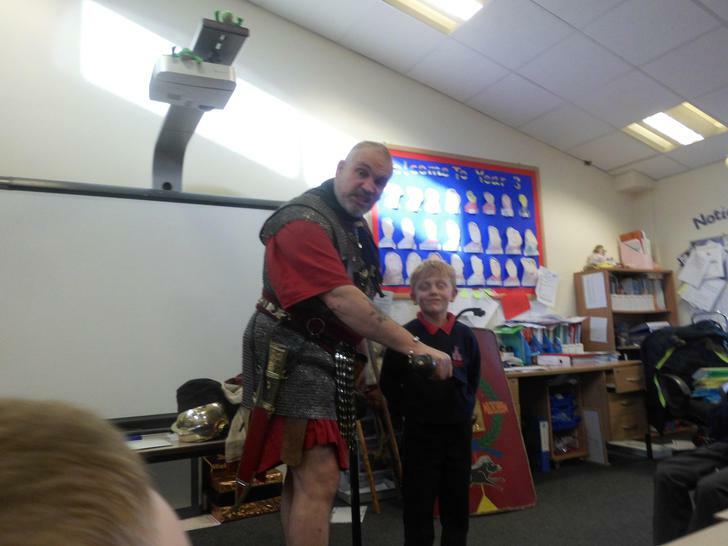 This weeks star pupil was Joshua. 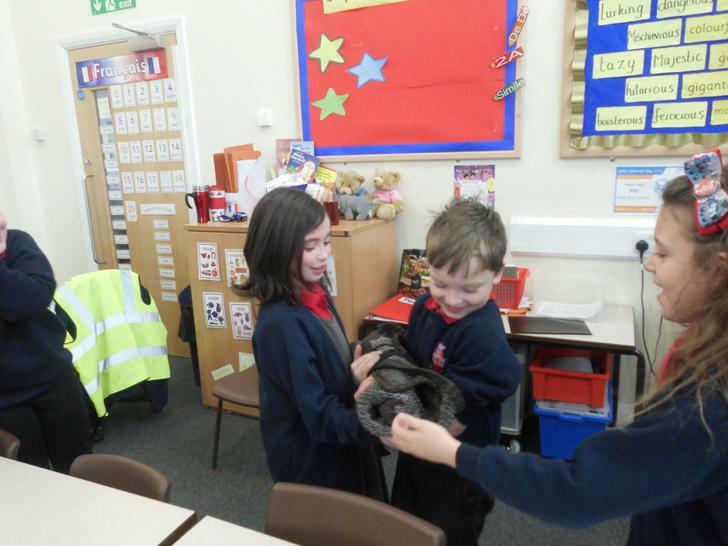 Joshua has been on task ALL week and has given 100%. 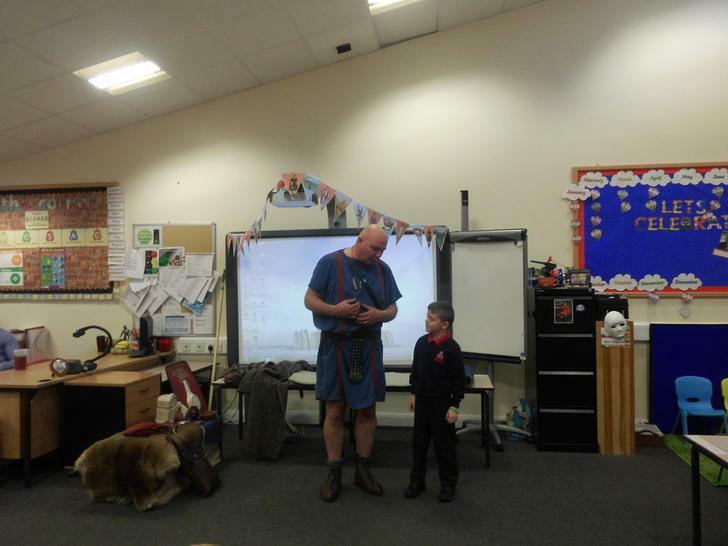 Even his Read Write Inc teacher has been impressed with his hard work and contributions. 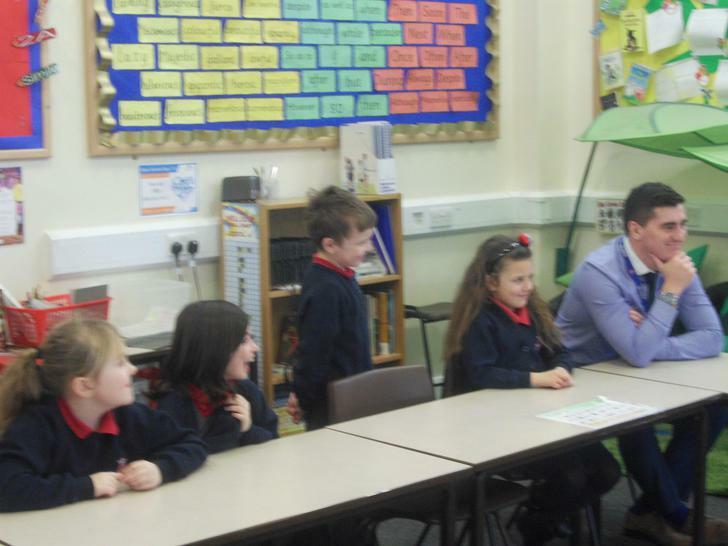 This week we have had 10 star readers!!!! 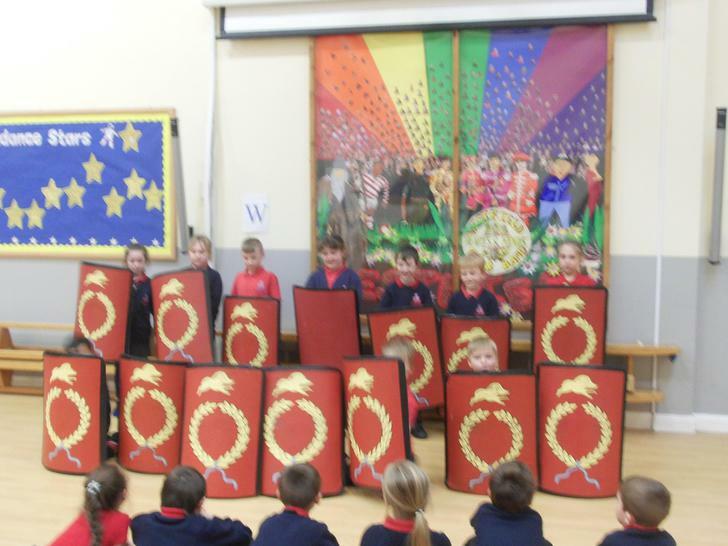 Well done guys Keep it up! 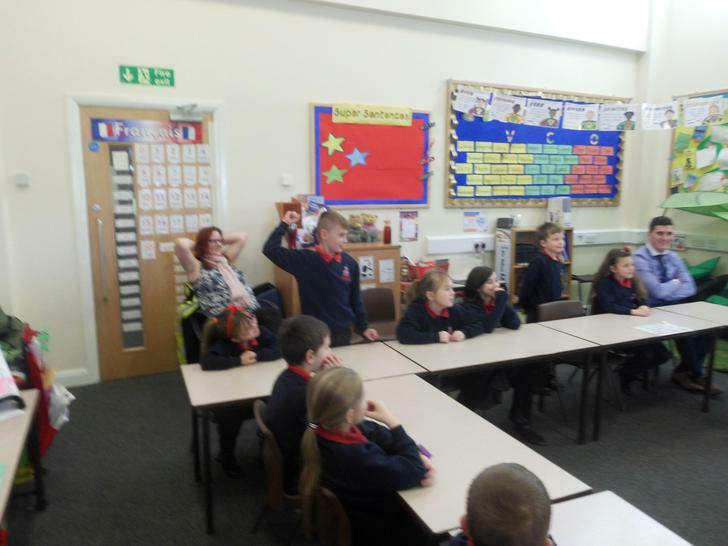 These star readers are: Anmol, Abigail, Mollie, Scarlett, KJ, Braydon, Maddison, Kelsey, Evie and Ethan! 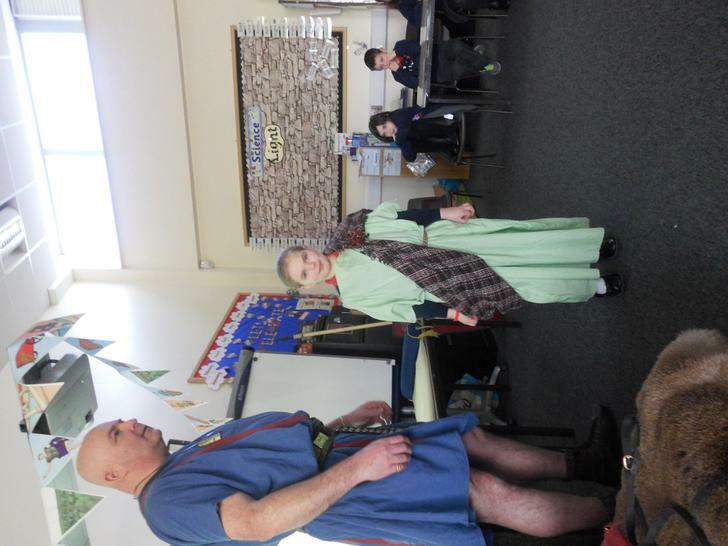 We have continued to look at time! 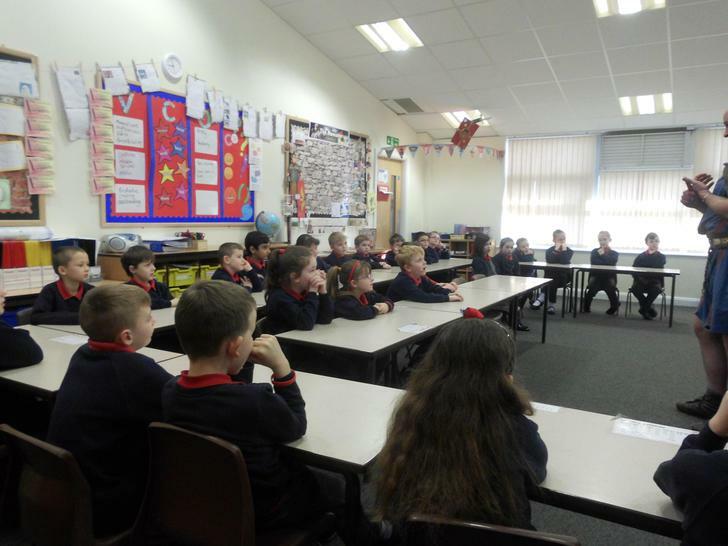 At the start of the week we solved time word problems, our brains were boggled! 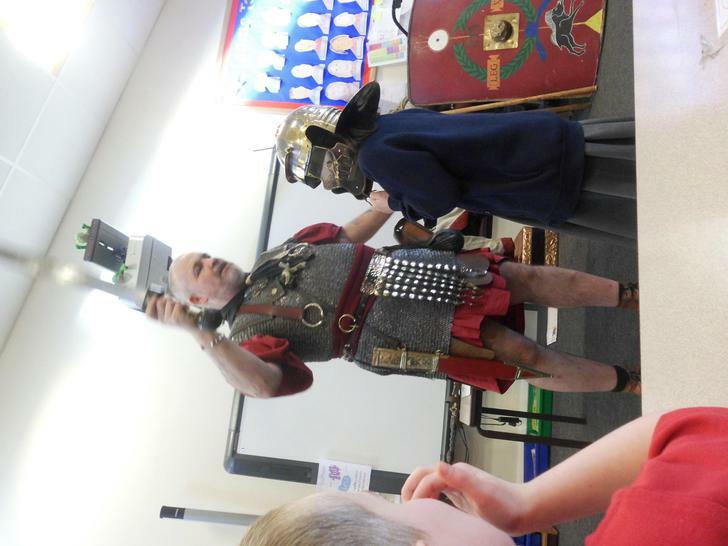 We then learnt how to tell the time on a clock with Roman numerals. 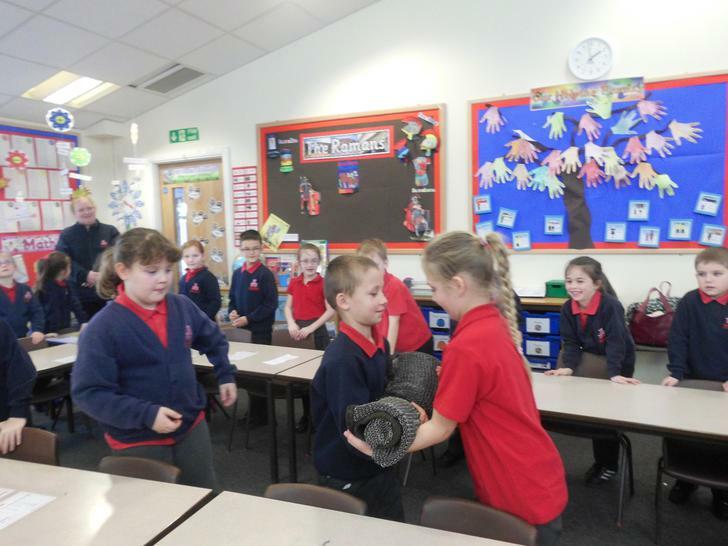 On Friday we had to convert time between seconds, minutes, hours and days. 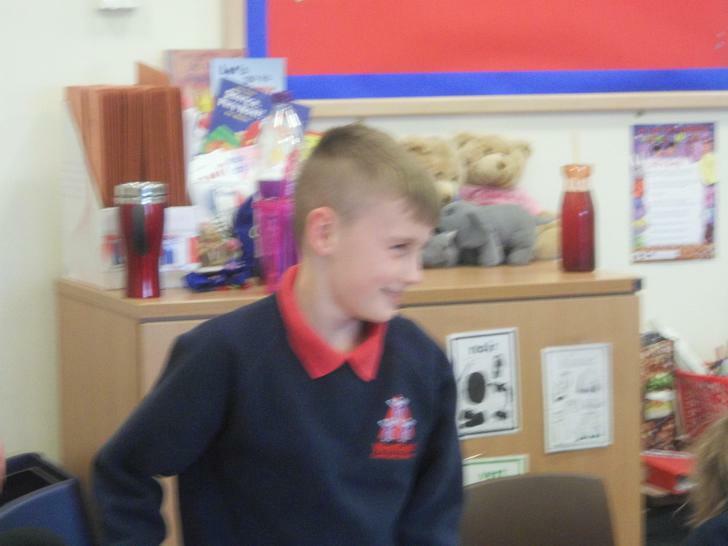 On Monday we learnt some new spellings and had lots of activities to complete using these new words we have learnt. 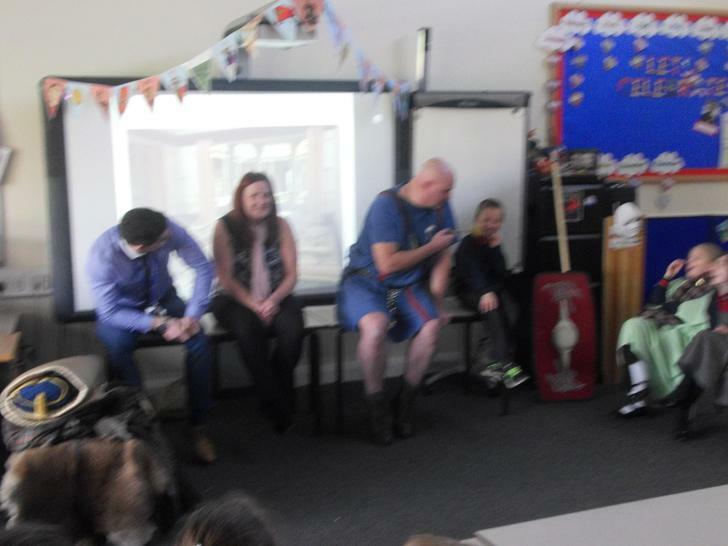 On Tuesday we wrote a letter to Vesuvius pretending to be the Emperor thanking him for his invention and fantastic party! 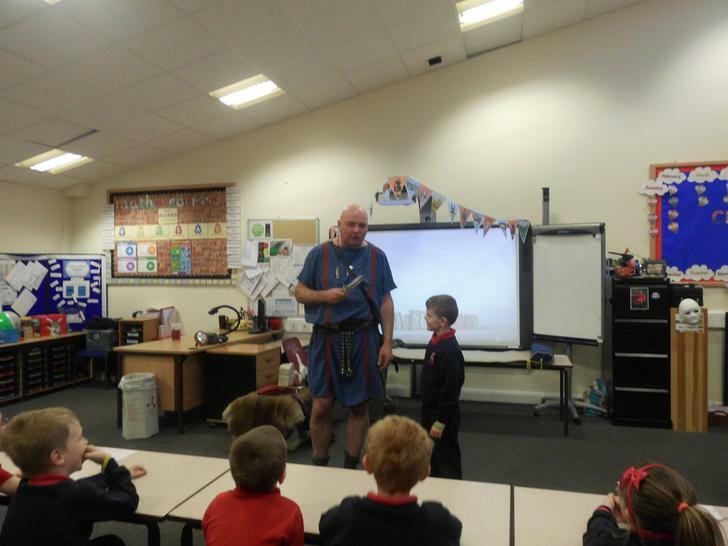 Towards the end of the week we wrote a description about our Roman visitors! 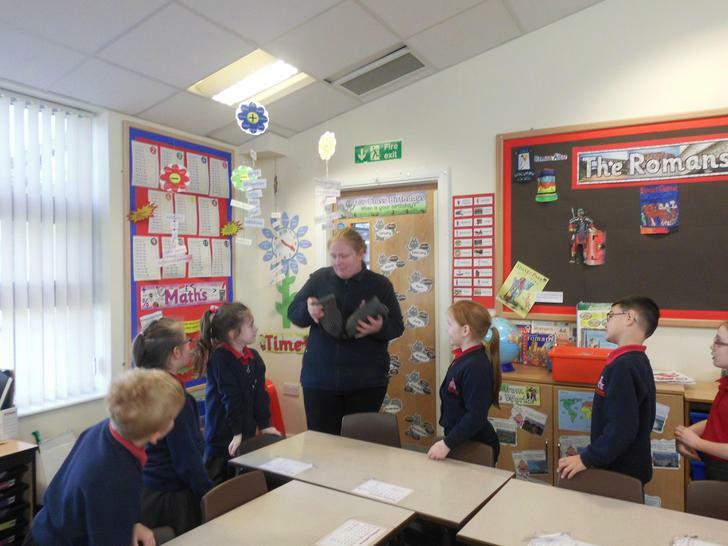 On Friday we learnt how to use adverbs to add more detail. 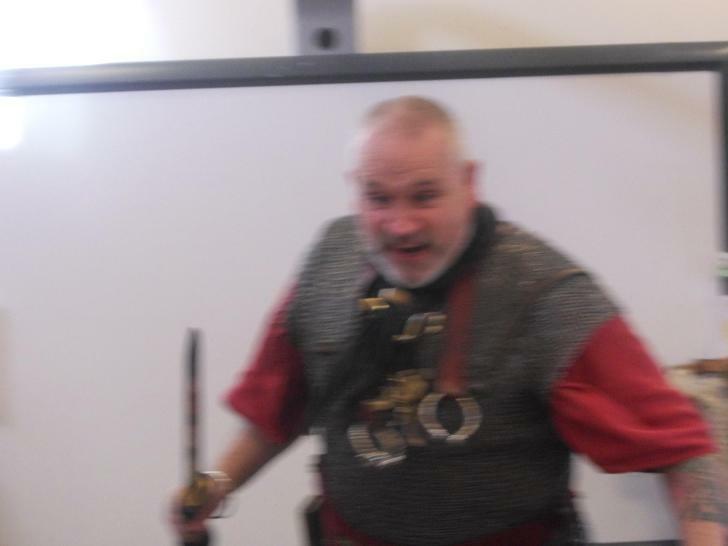 Loud Noises! 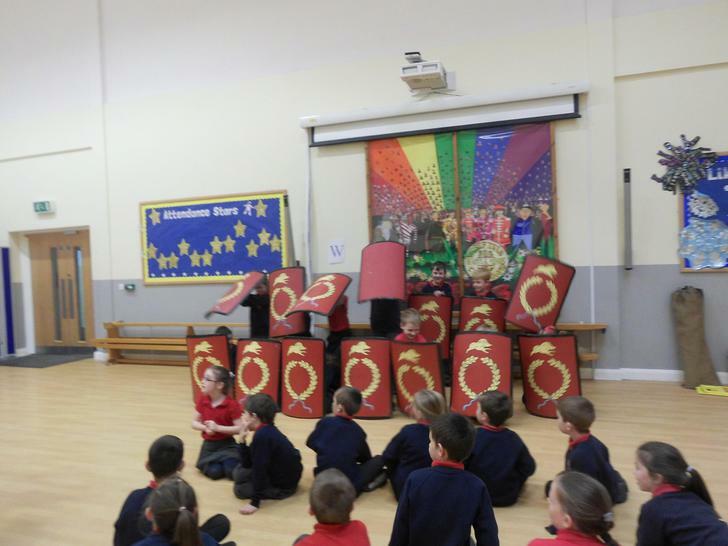 We continued to make very loud noises with our steel drums. 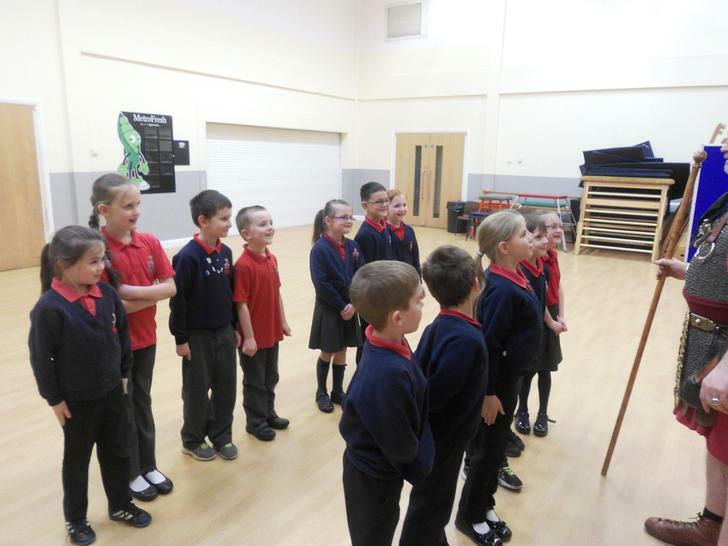 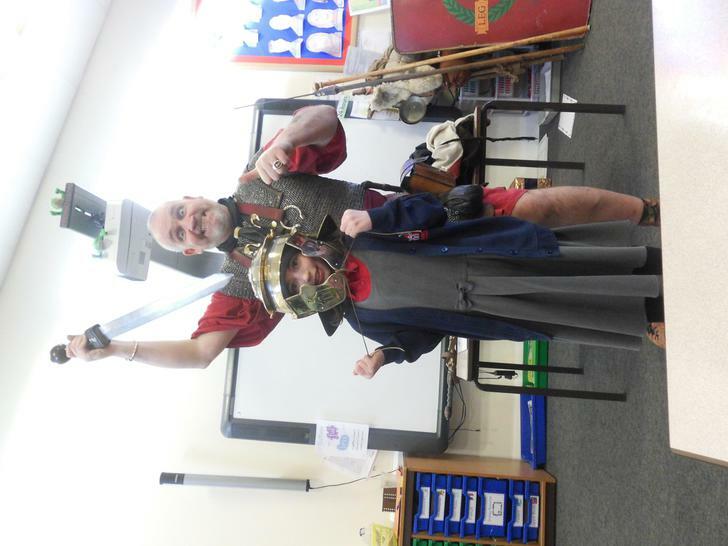 Mr Grimshaw says we are improving every week! 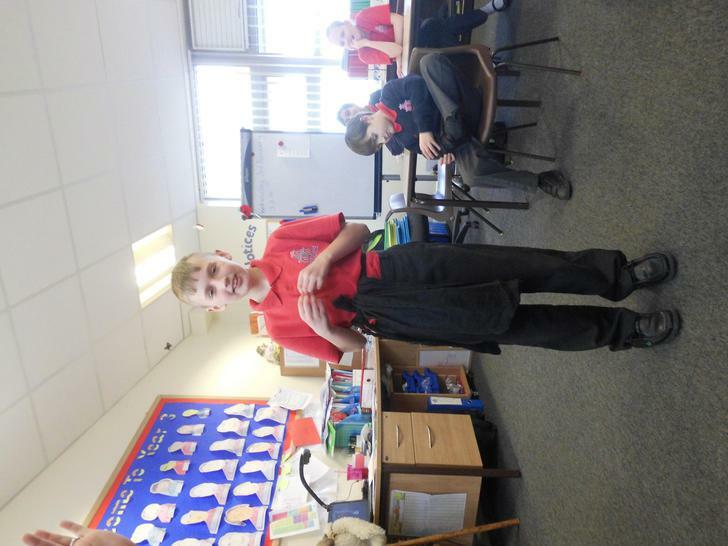 In R.E we looked at Jesus's early life, we learnt all about the miracles he performed. 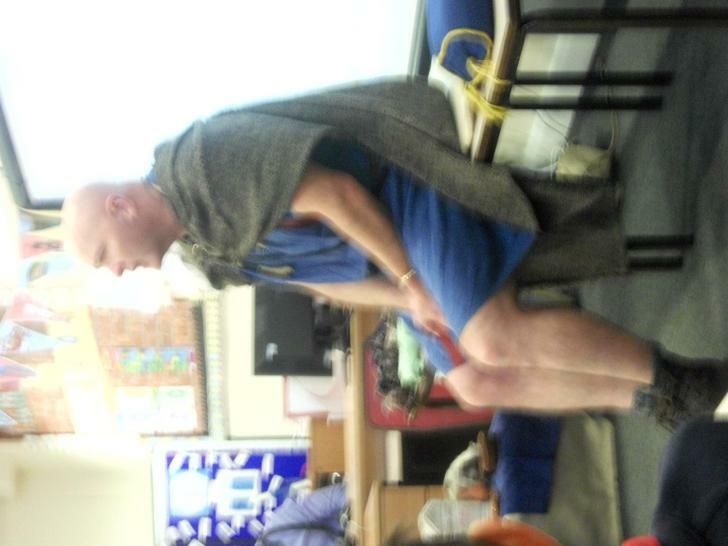 Can you believe he turned water into wine and fed the 5000? 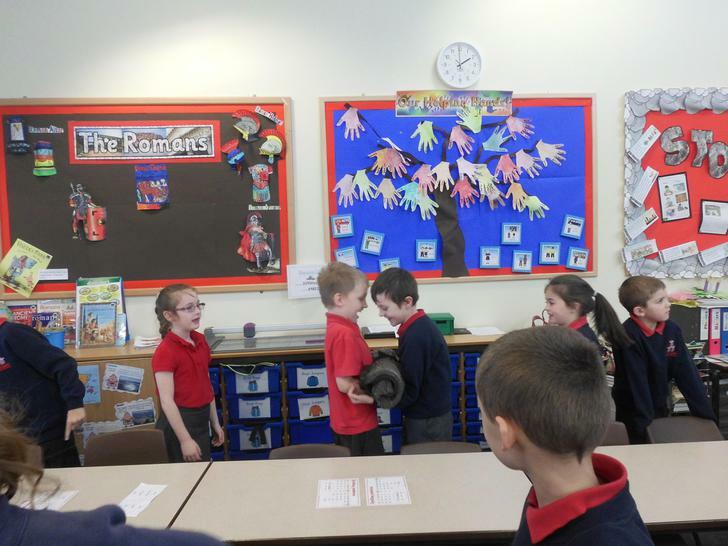 This week we had a change as we couldn't use the hall for our gymnastics lesson, so we learnt how to play football rounders! 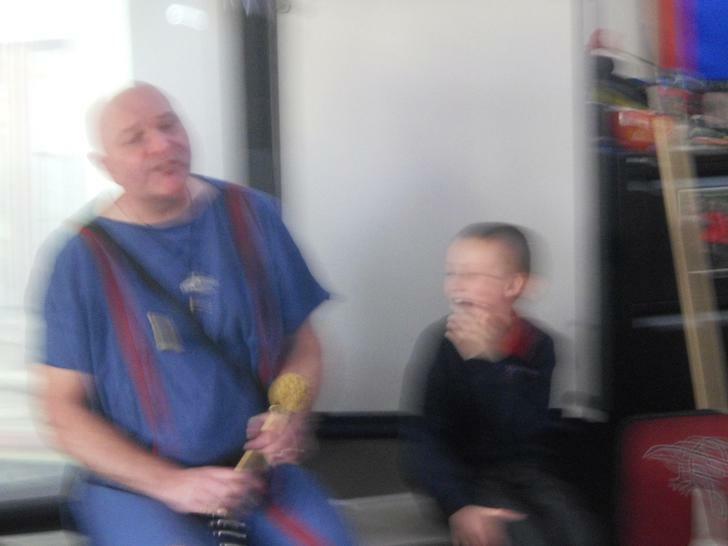 It is so much fun, you should try it, maybe we can teach you too. 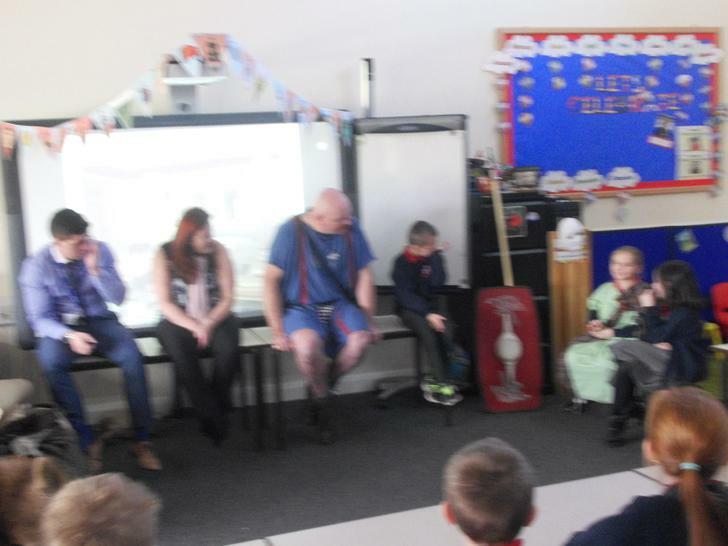 Wednesday was a topic filled day, we will talk about that next. 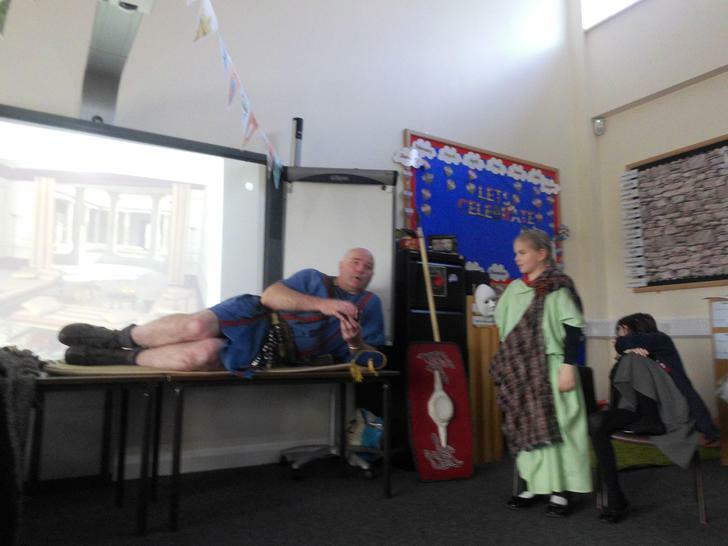 On Friday we learnt about Julius Cesar the Roman Emperor. 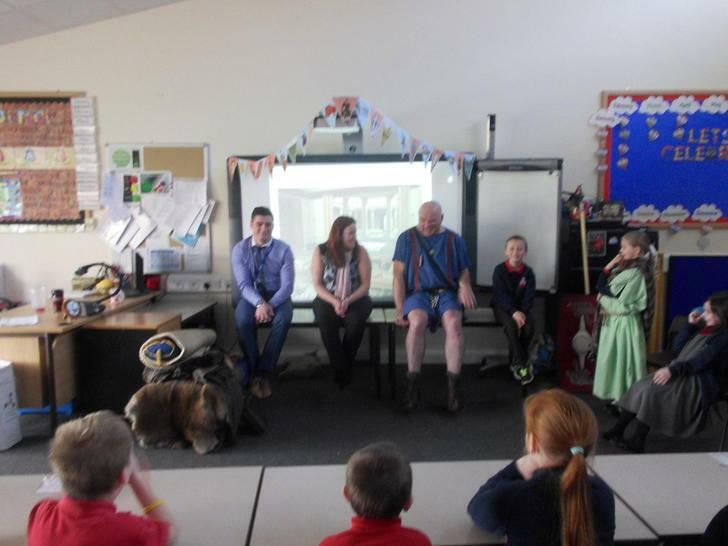 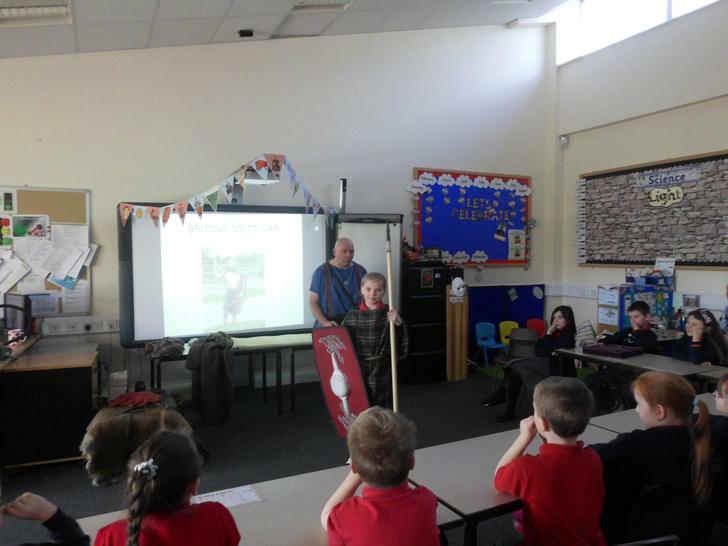 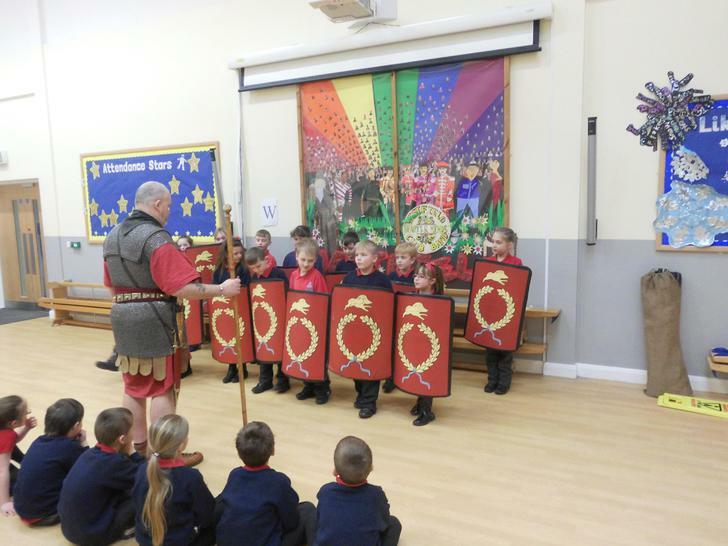 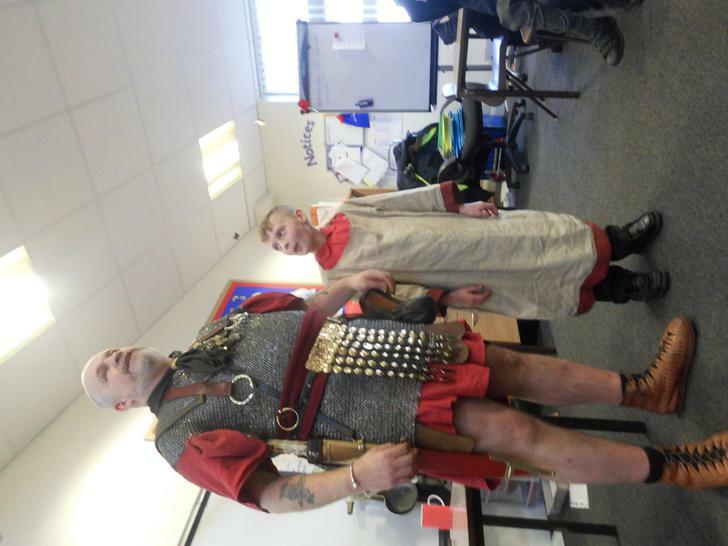 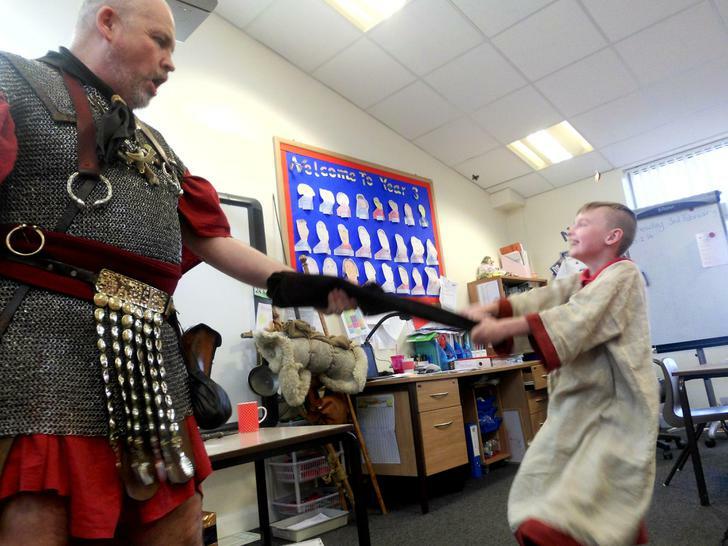 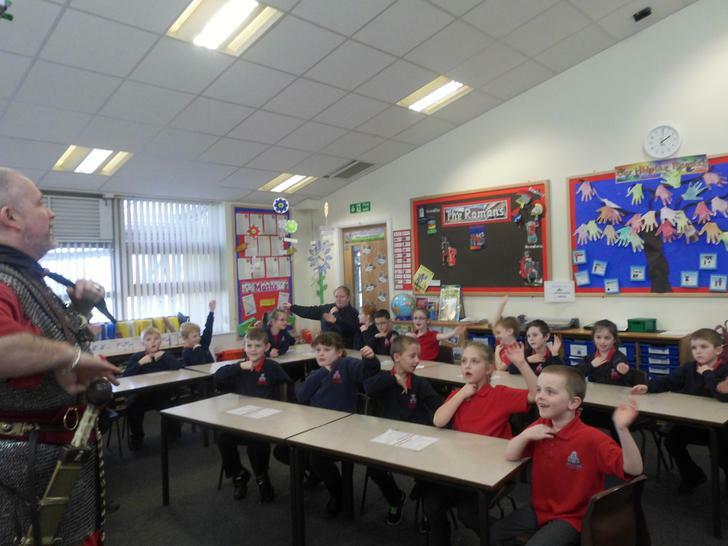 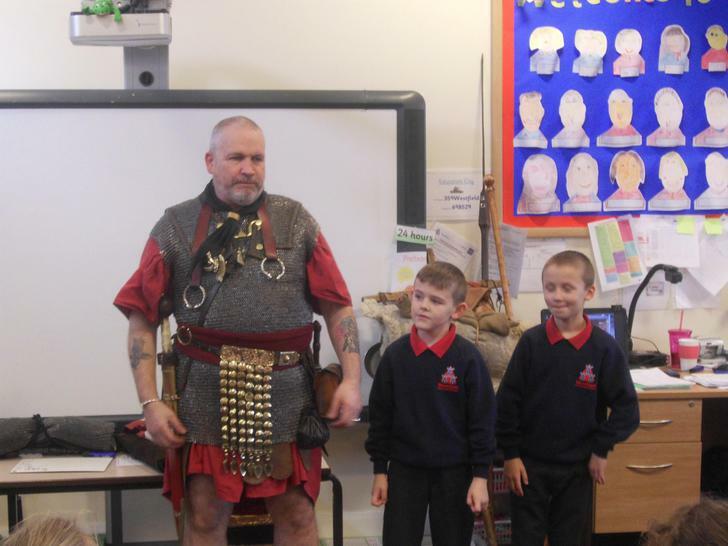 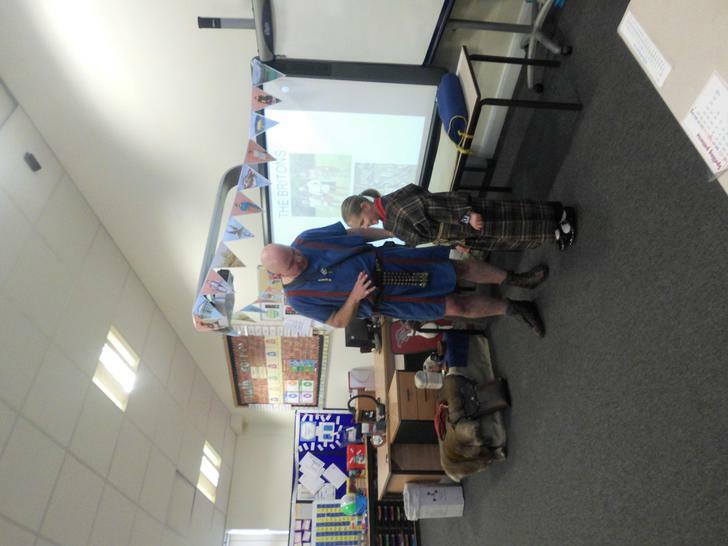 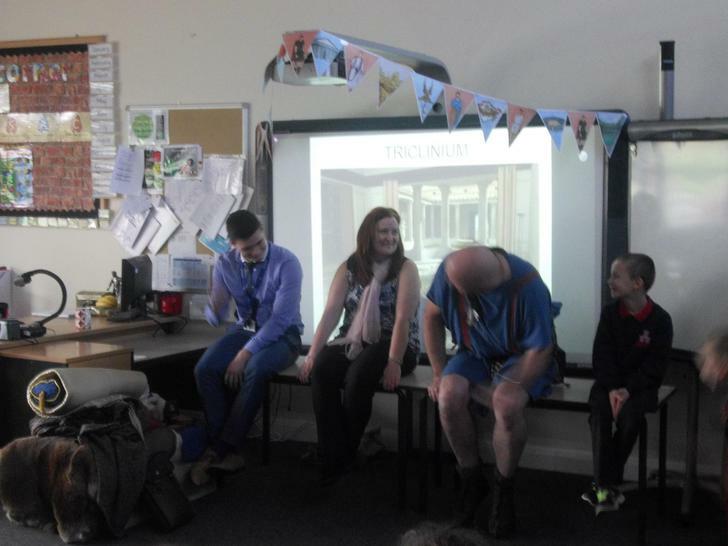 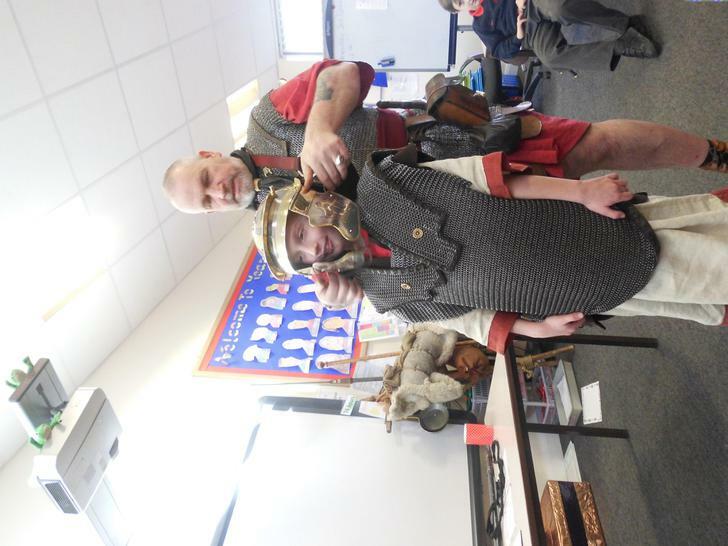 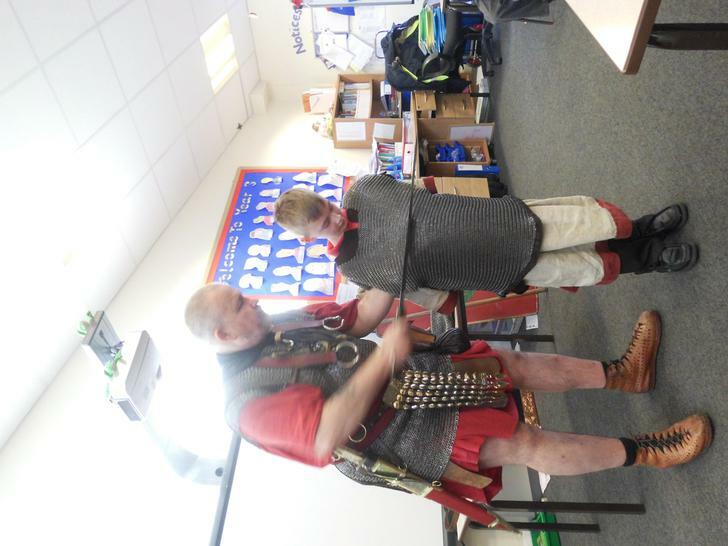 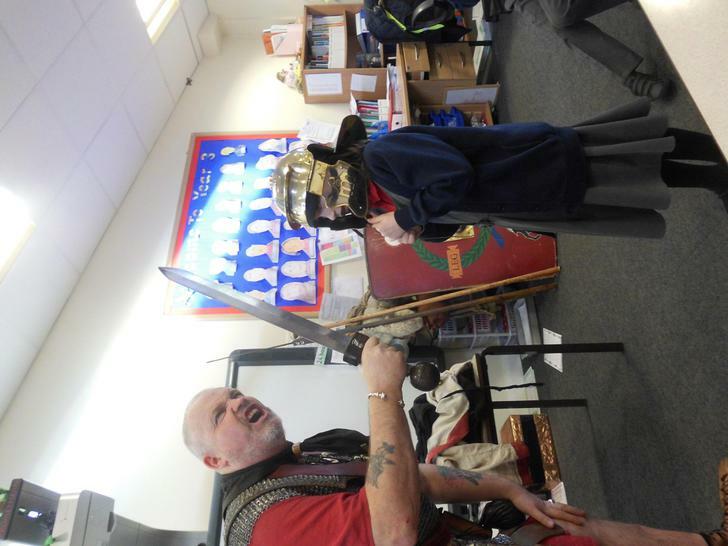 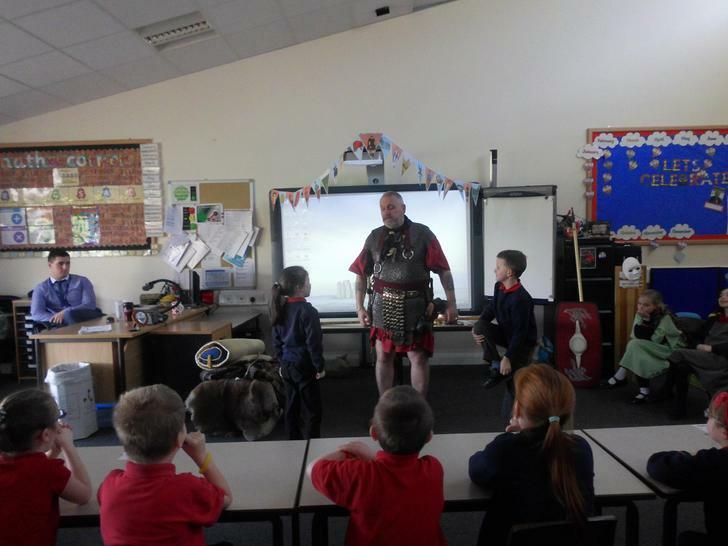 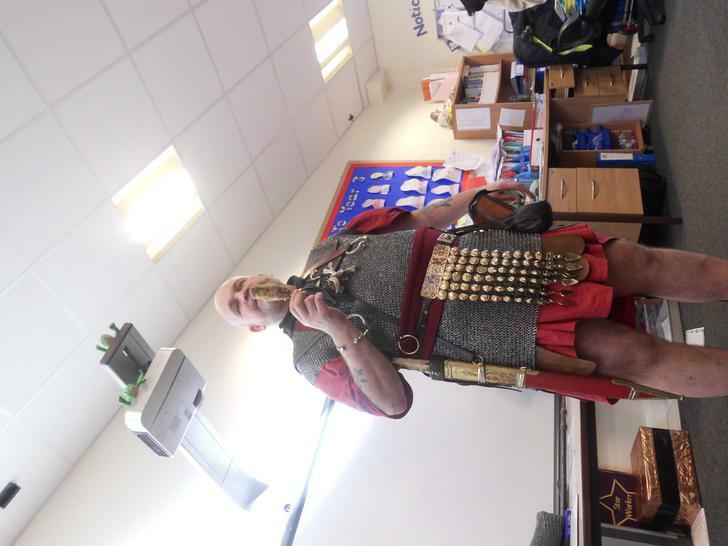 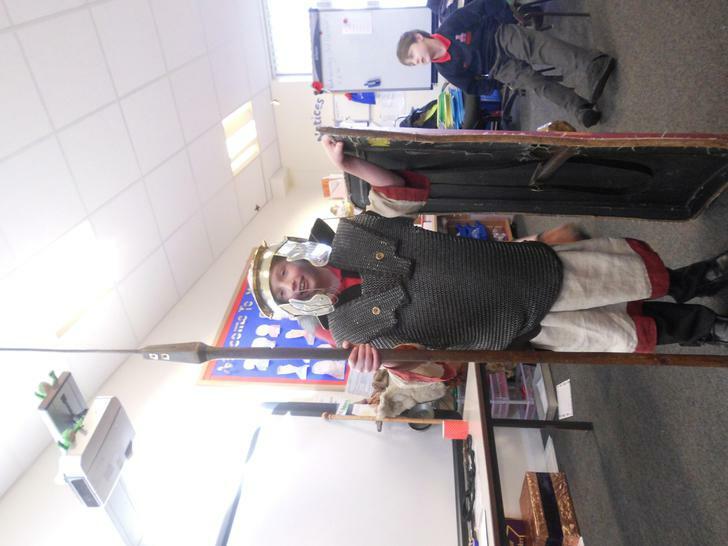 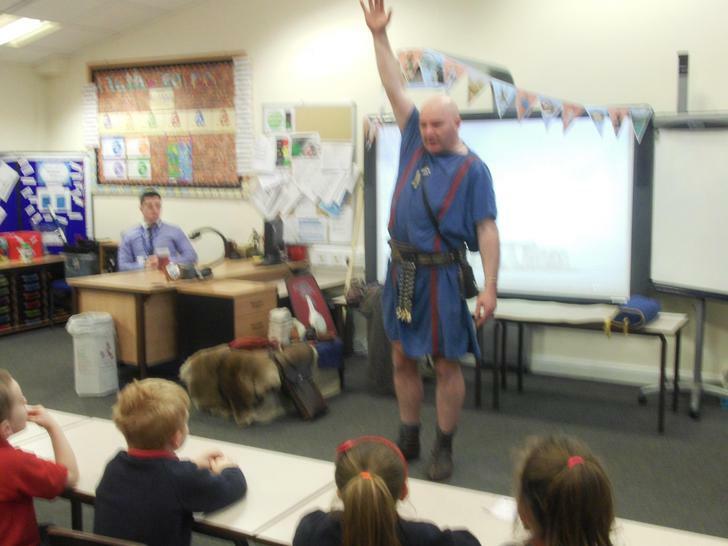 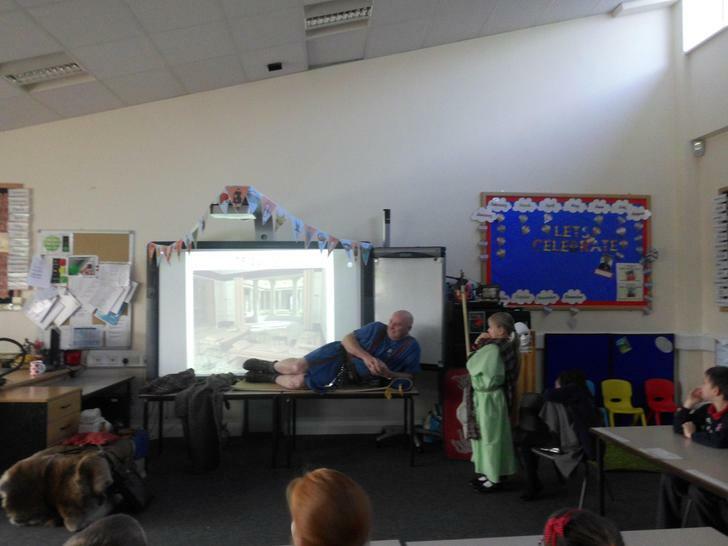 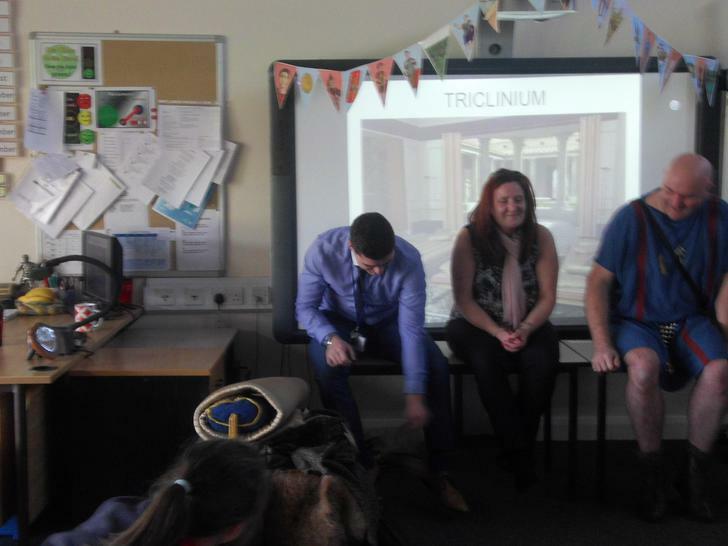 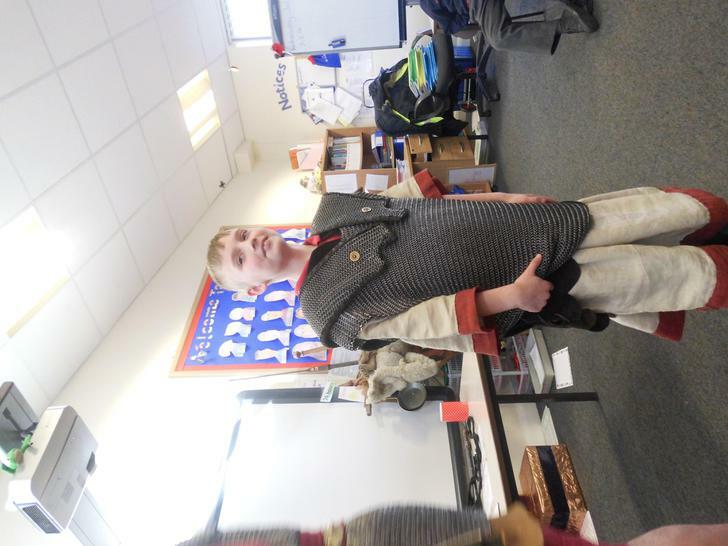 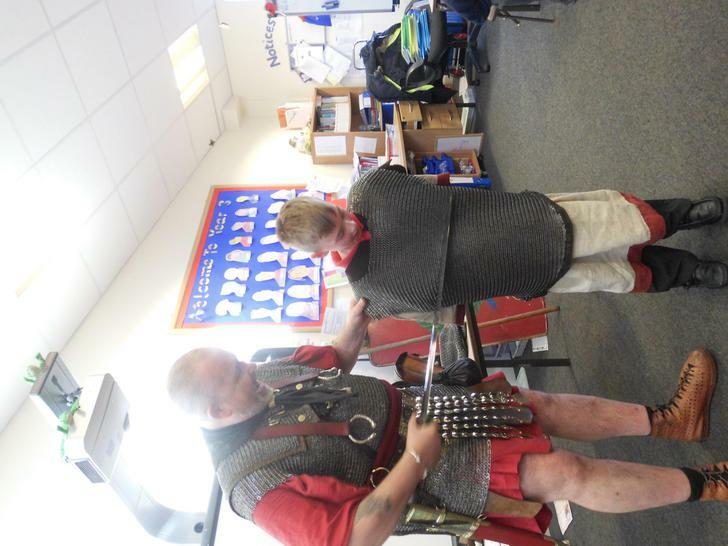 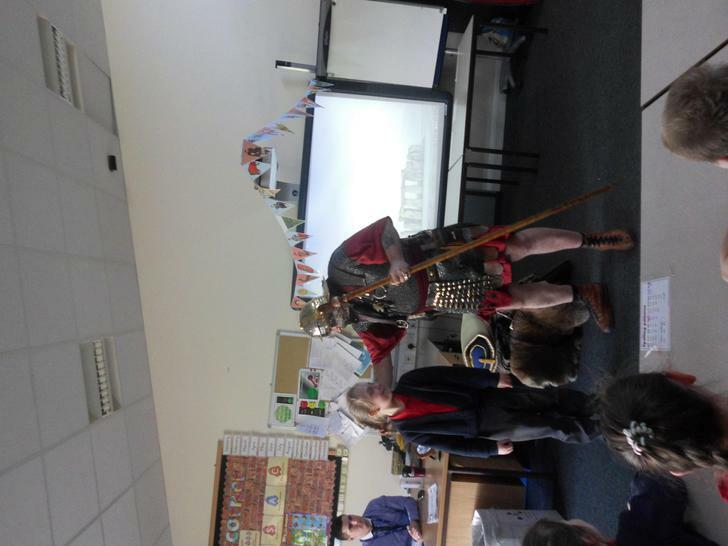 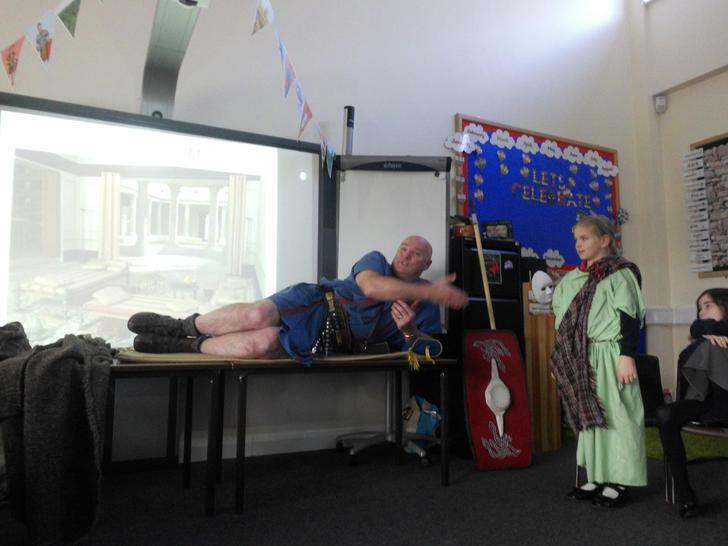 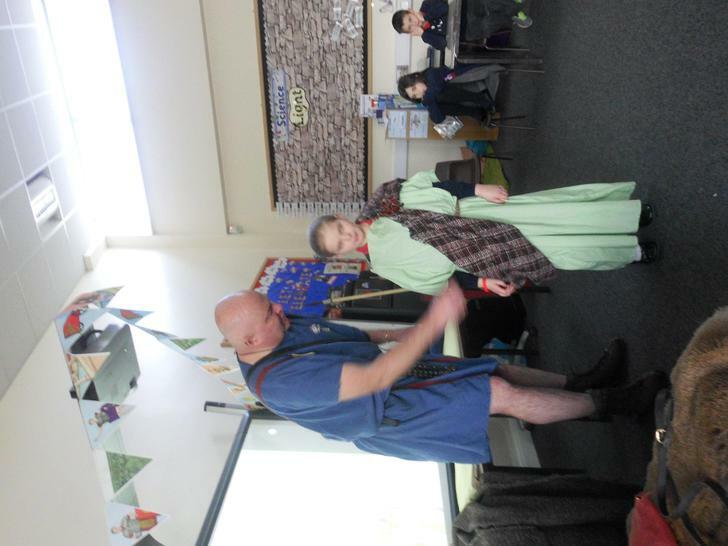 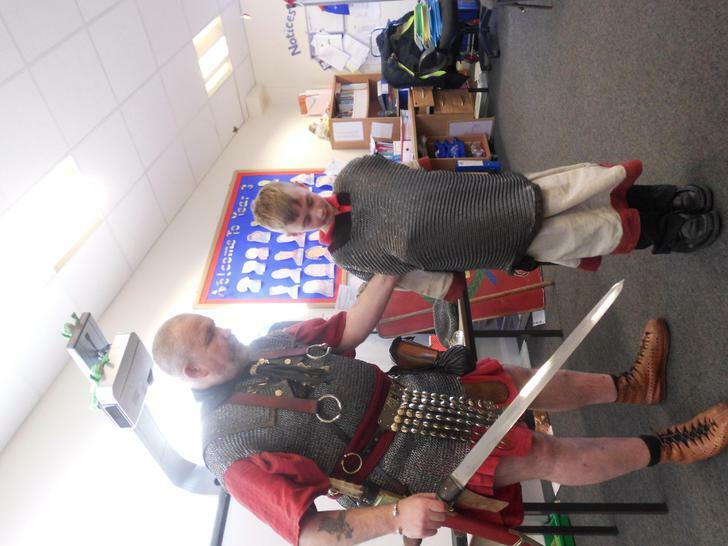 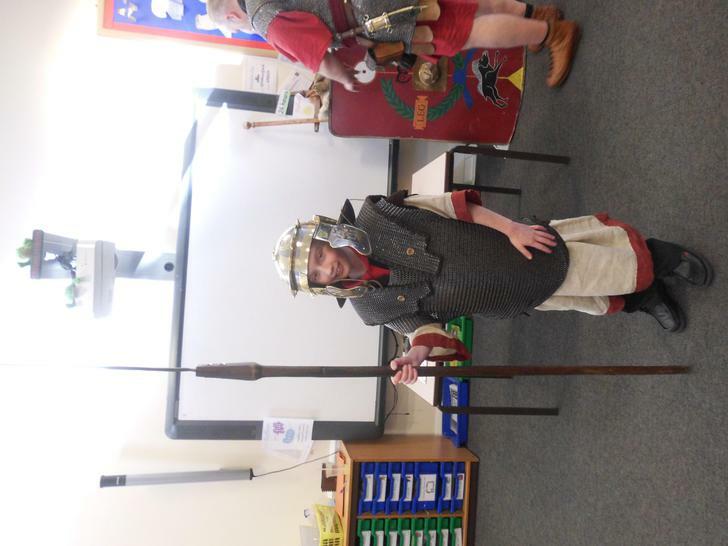 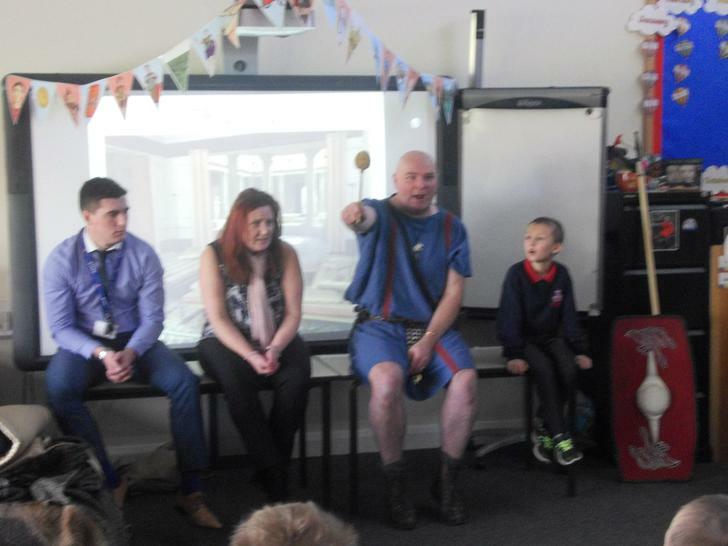 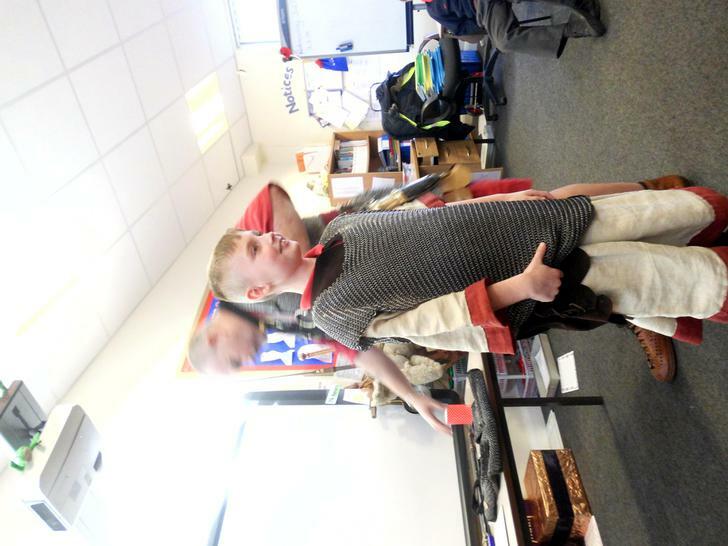 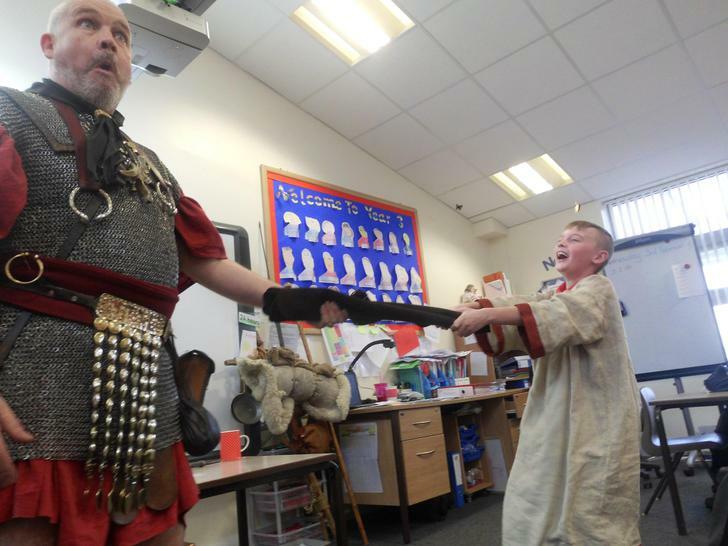 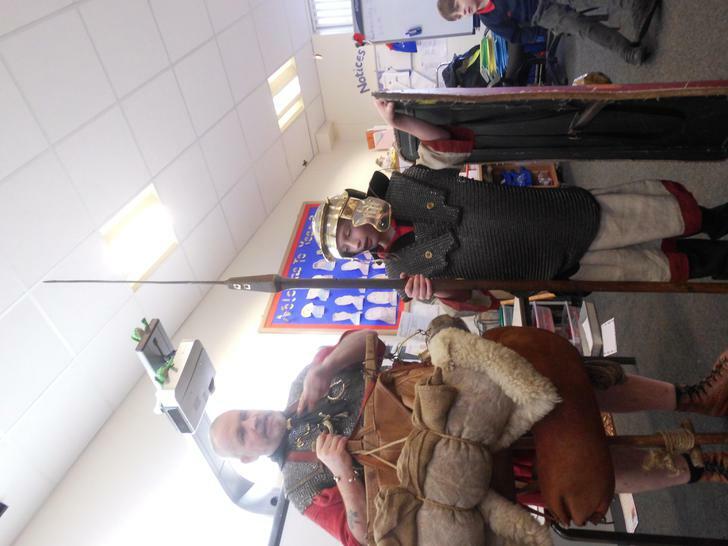 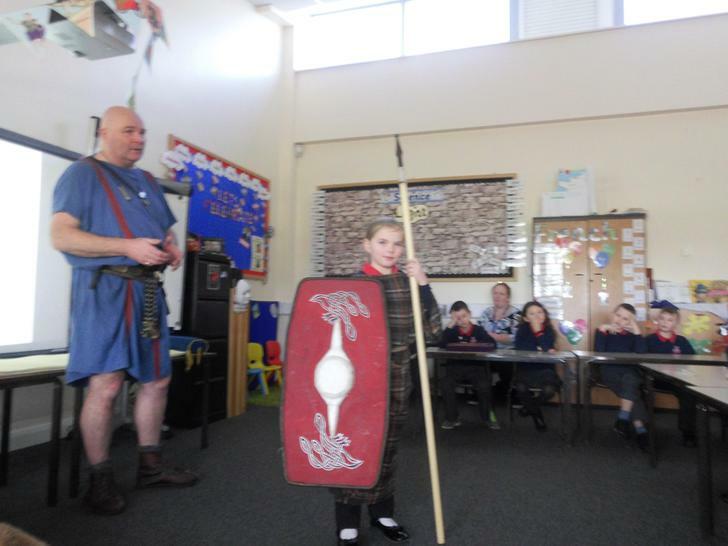 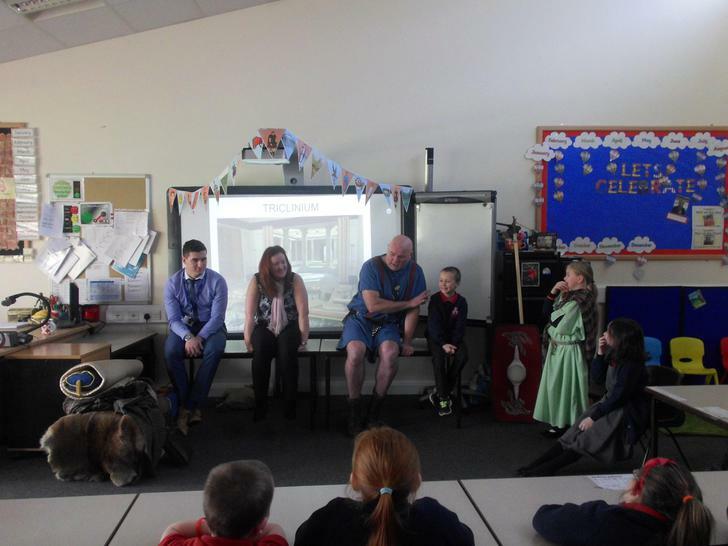 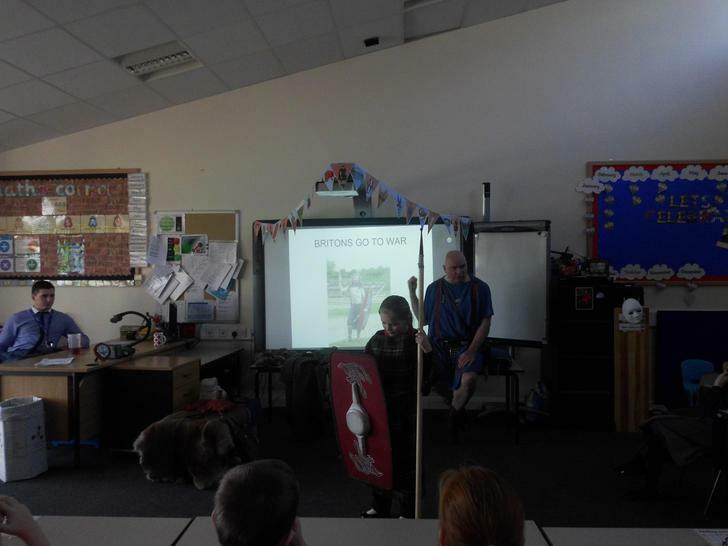 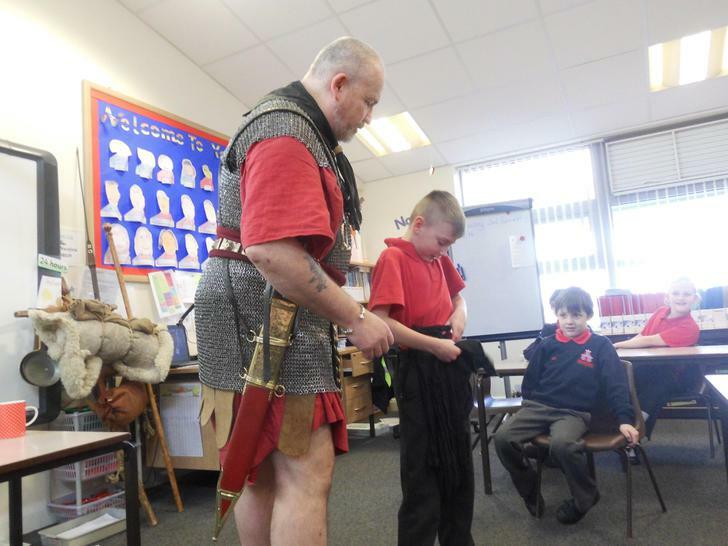 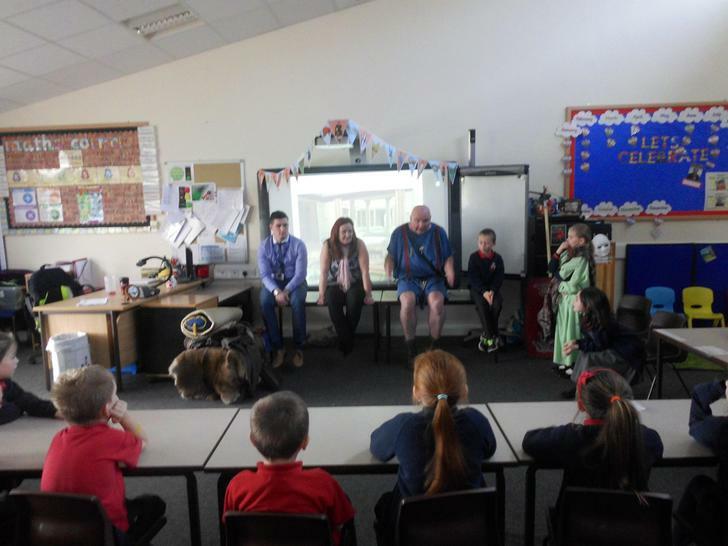 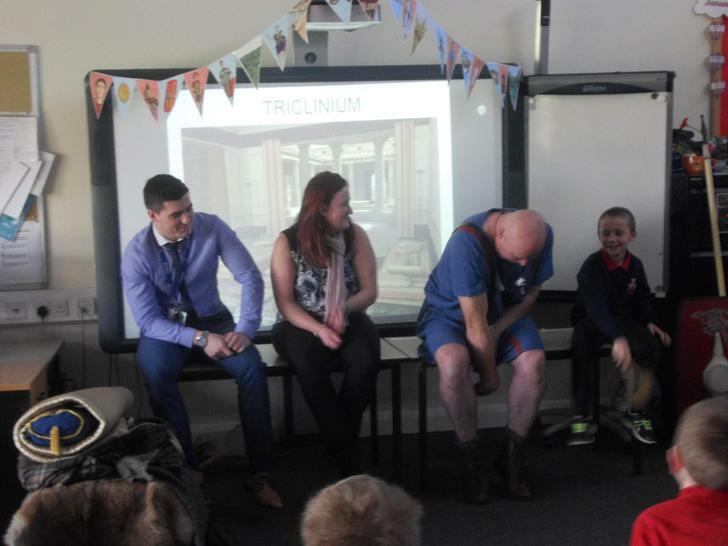 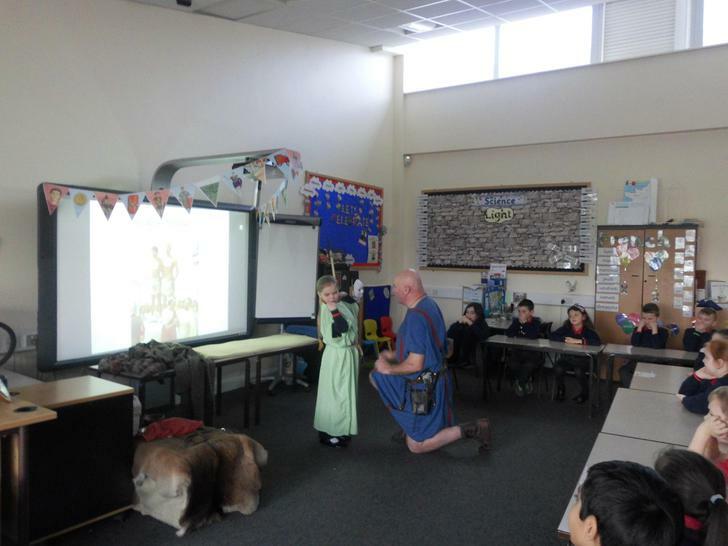 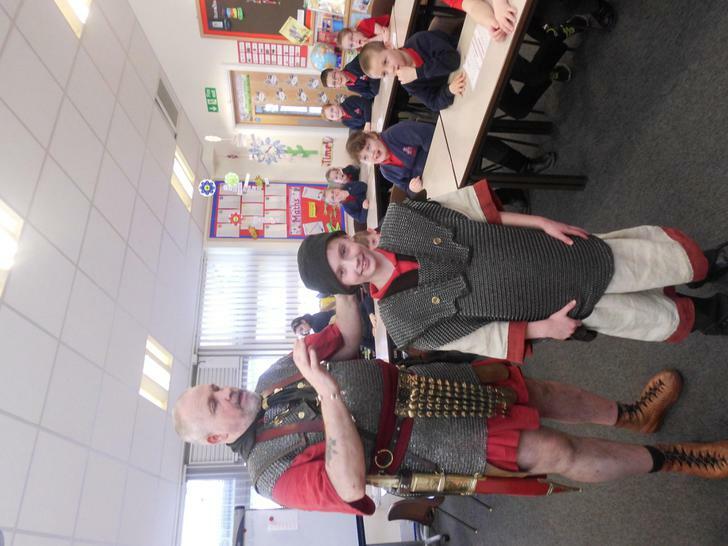 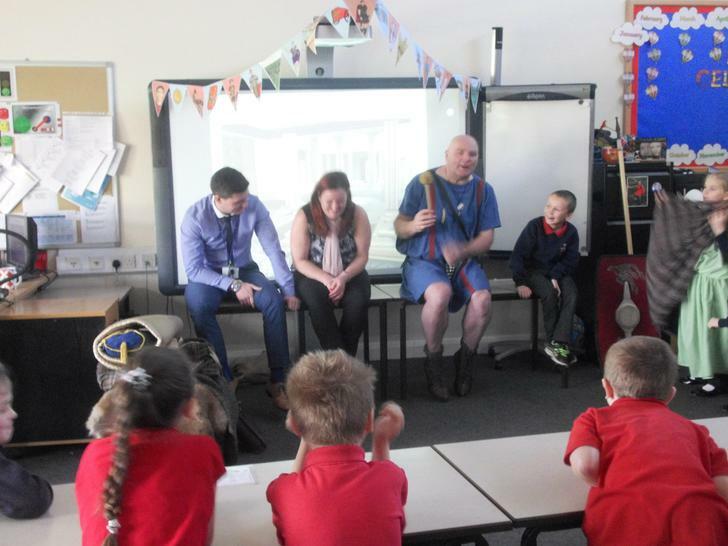 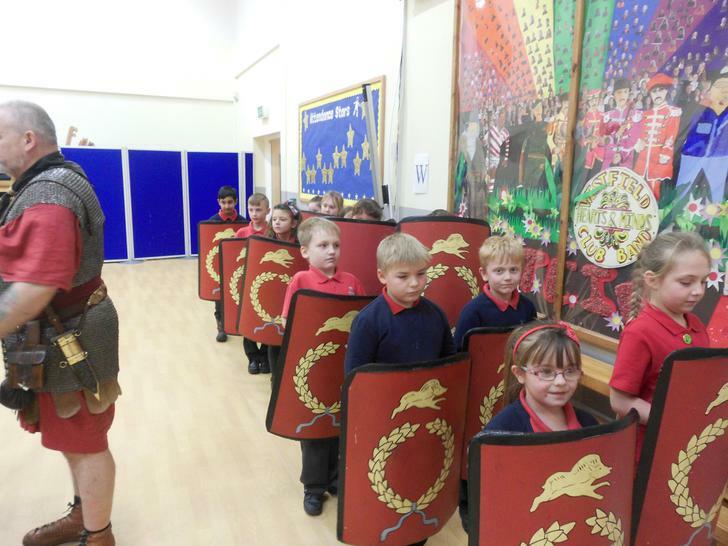 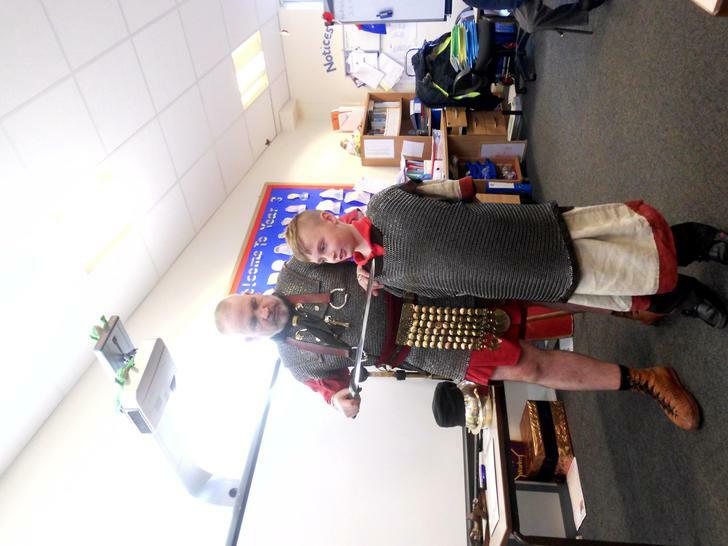 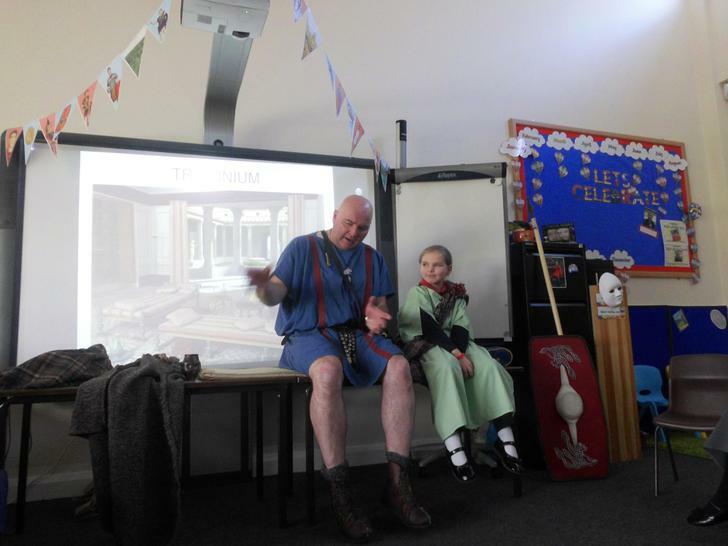 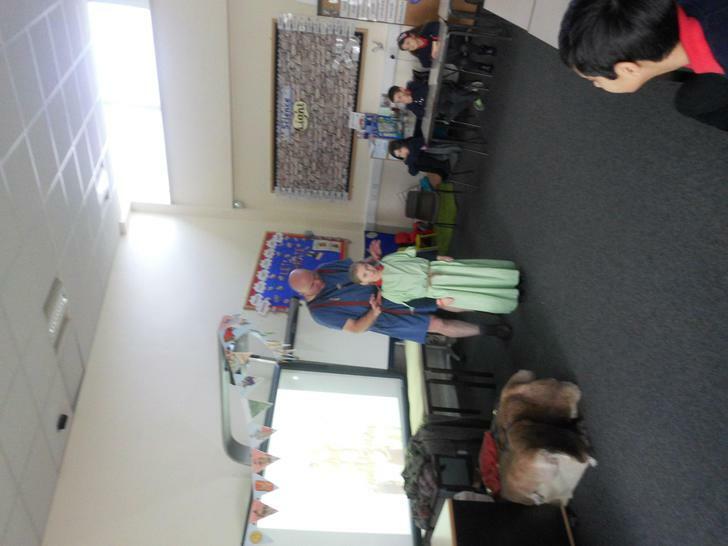 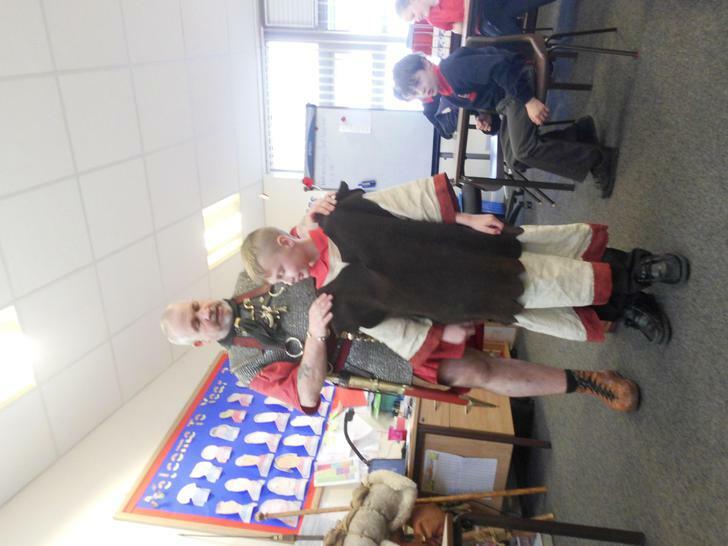 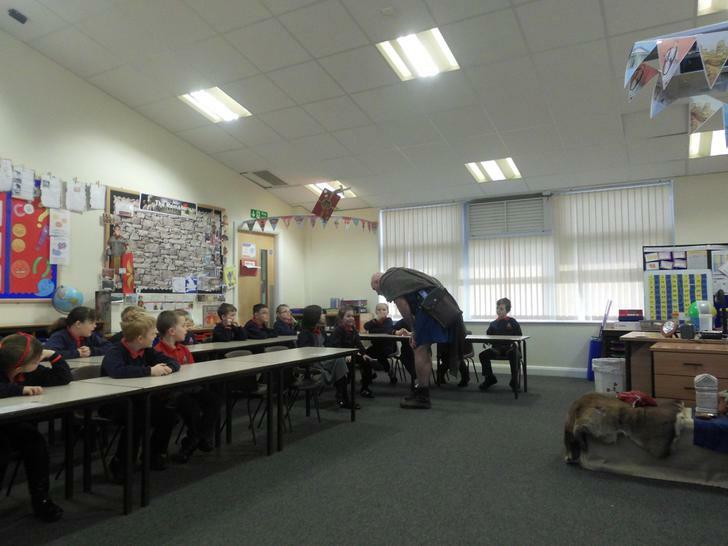 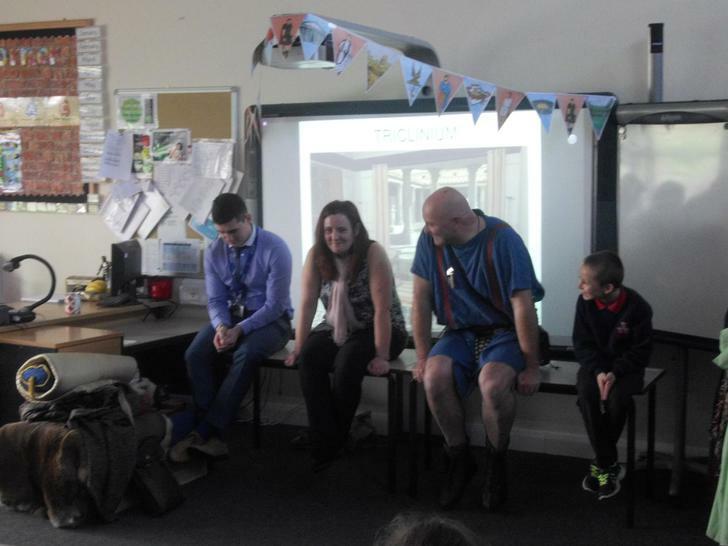 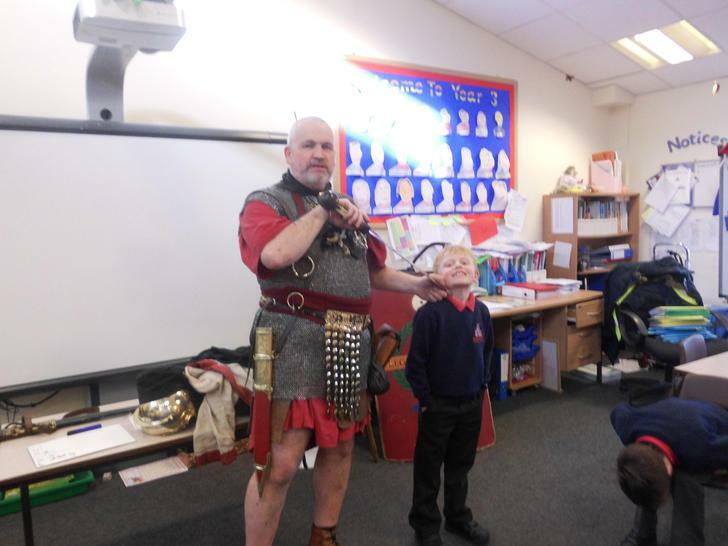 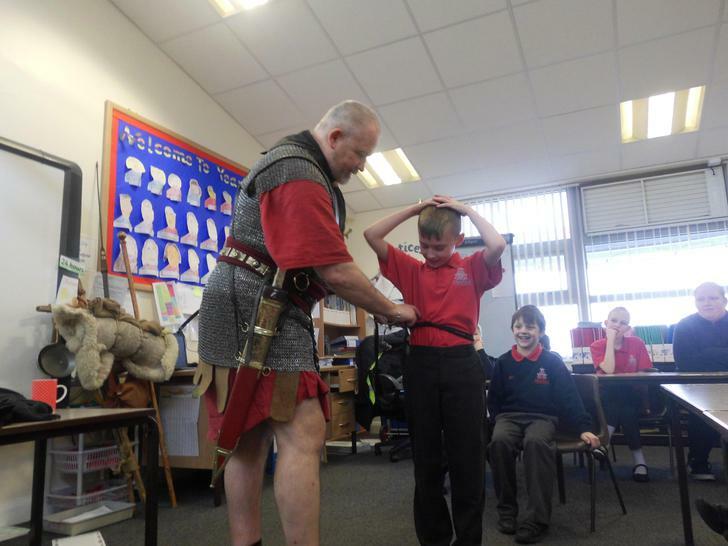 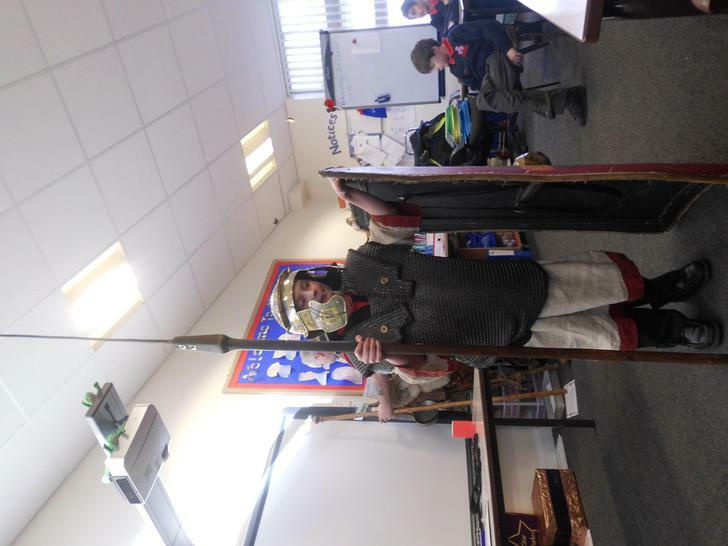 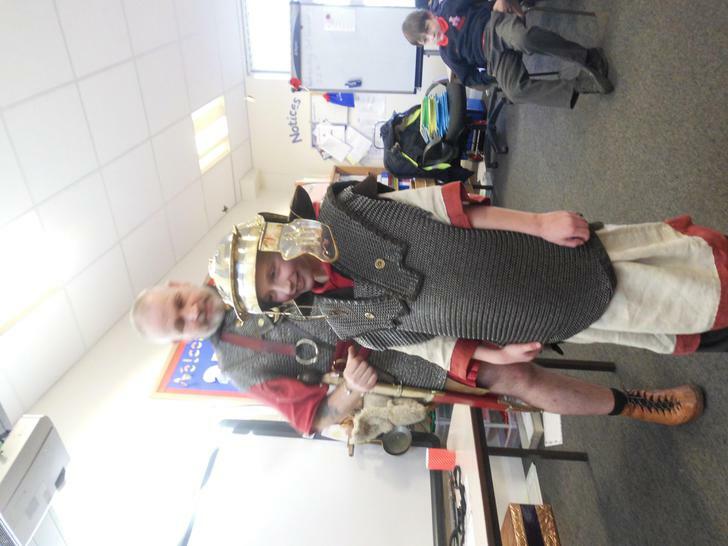 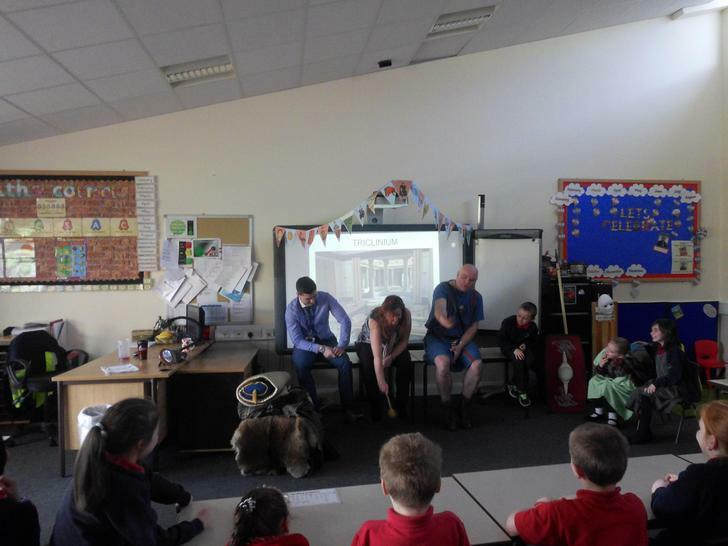 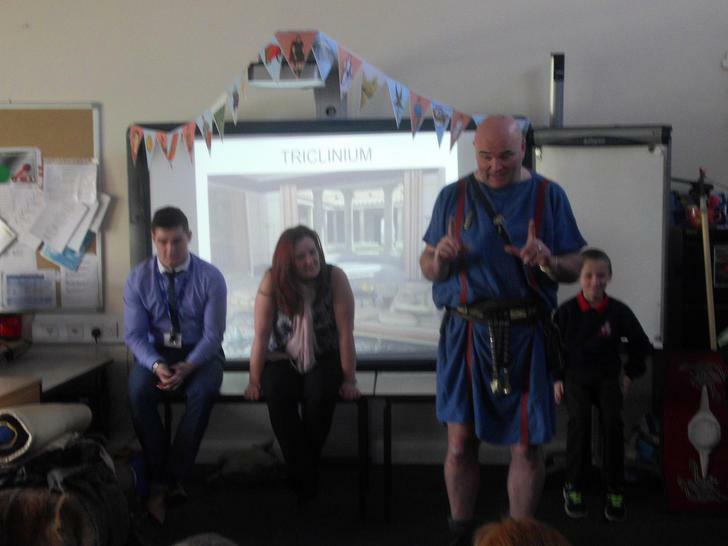 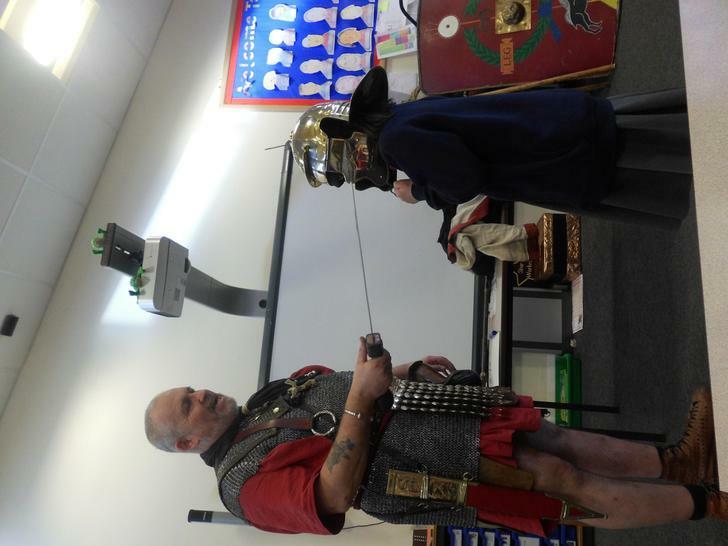 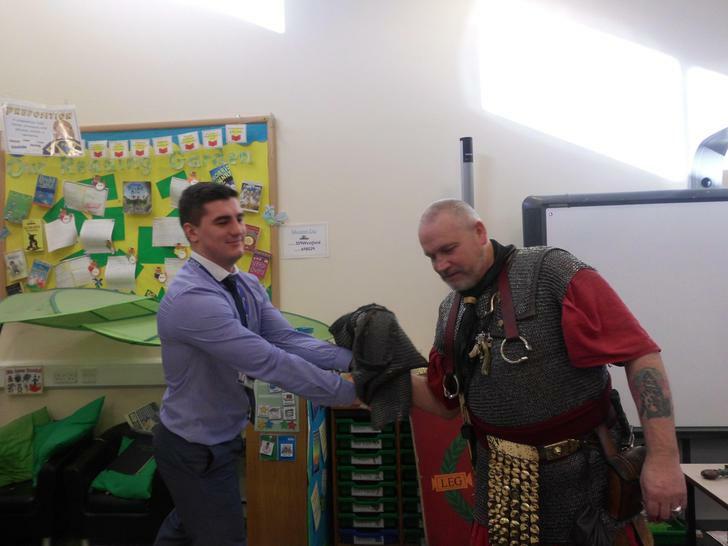 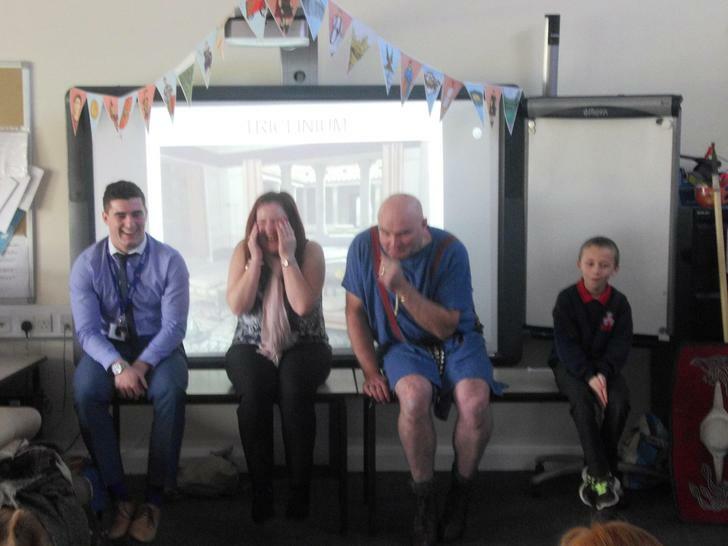 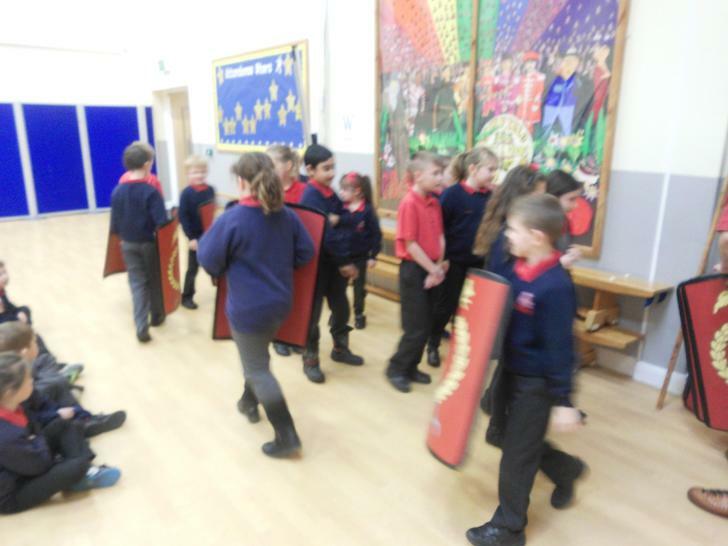 On Wednesday we had a fun filled day as Roman soldiers came to visit. 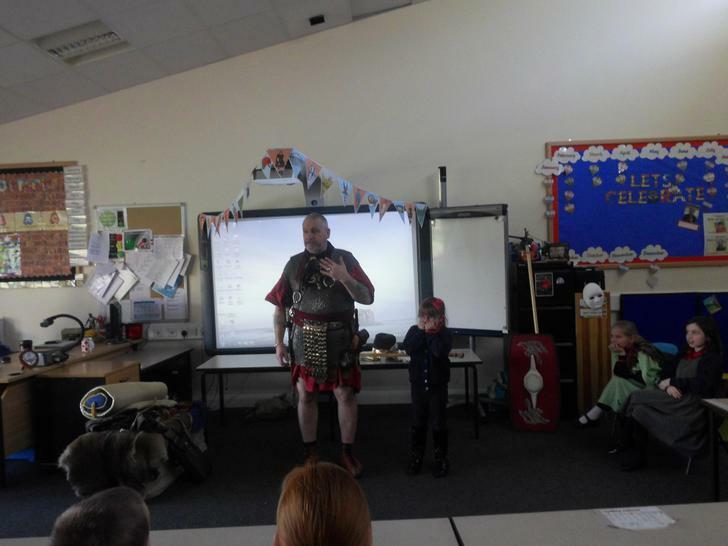 In the Morning we learnt about Britons and Romans. 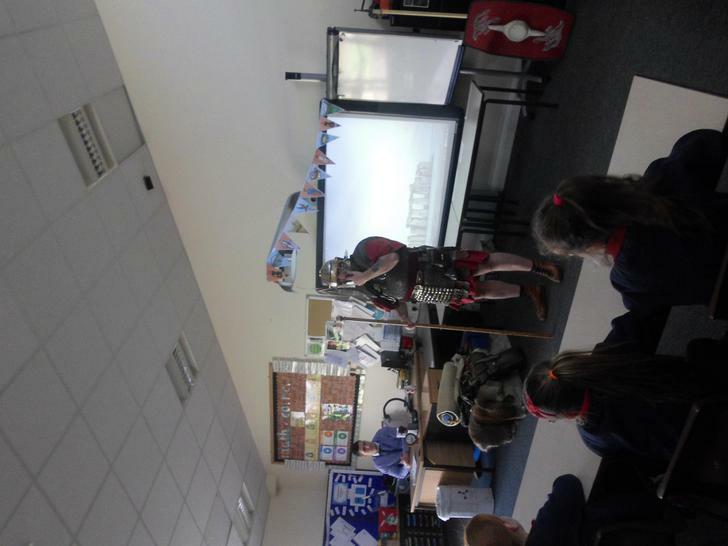 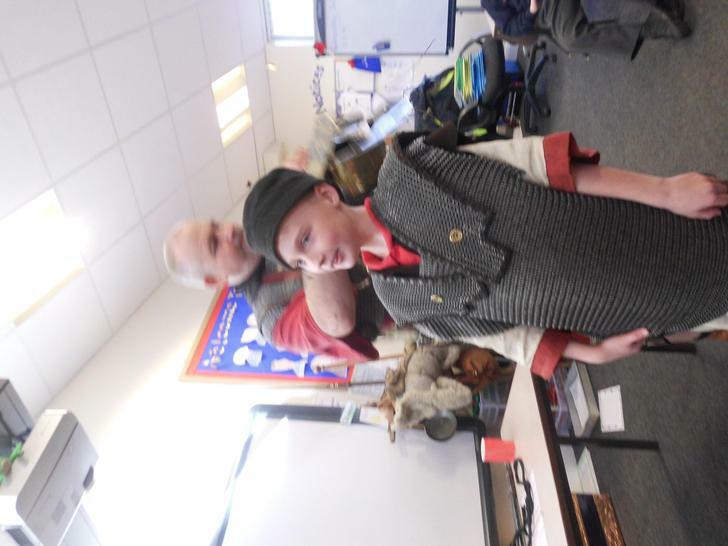 Longus the retired Roman soldier told us how different they where. 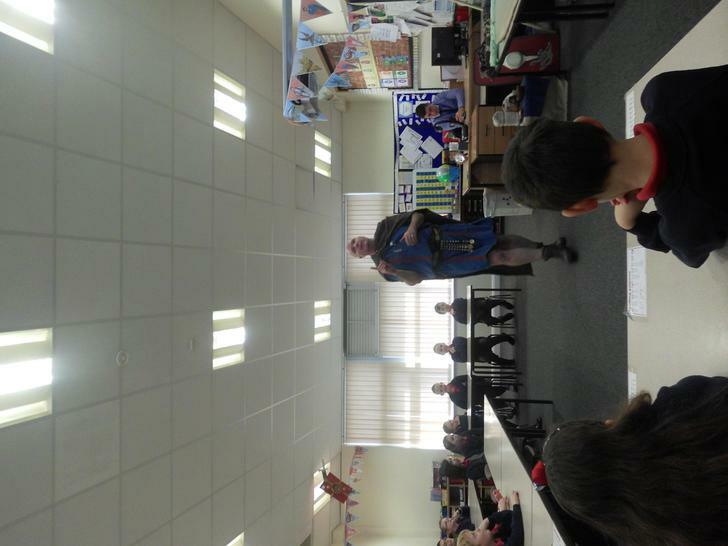 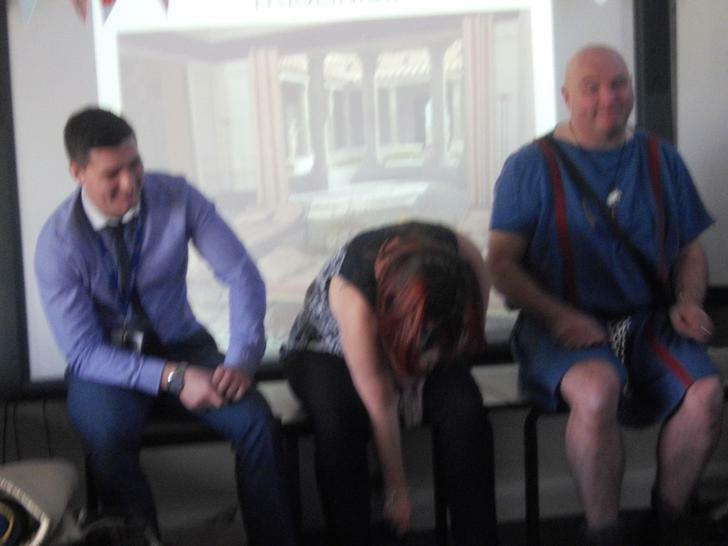 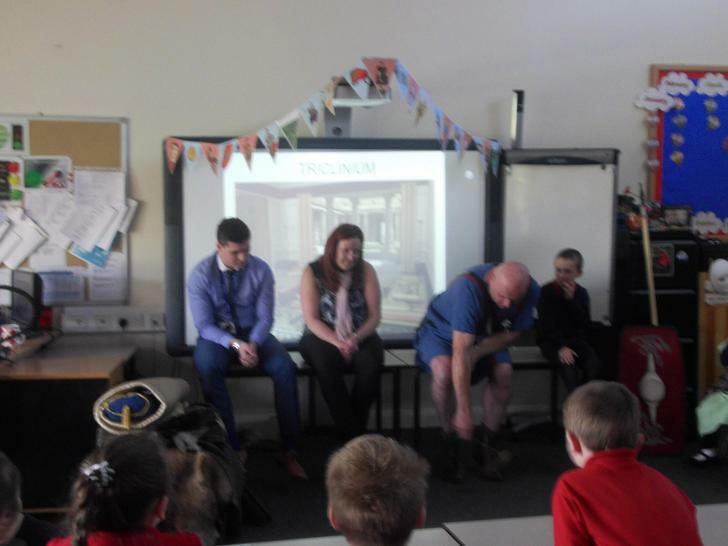 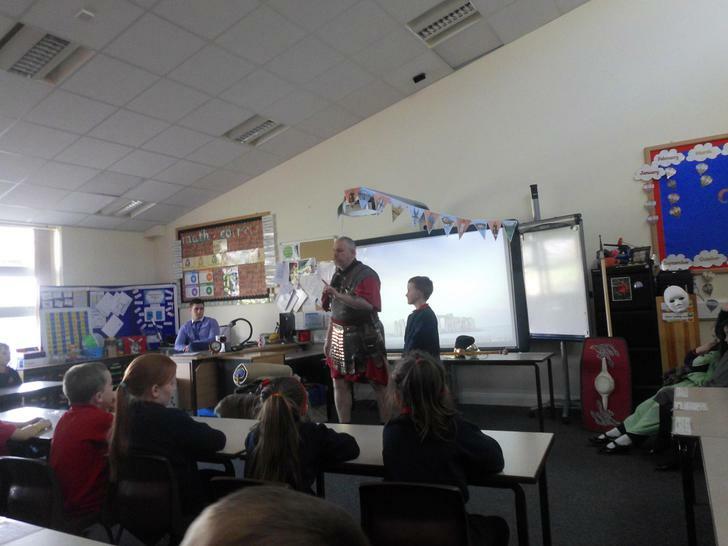 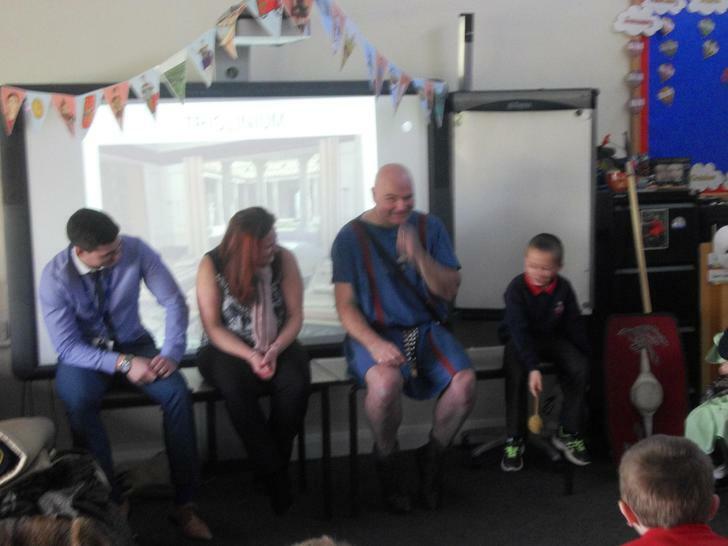 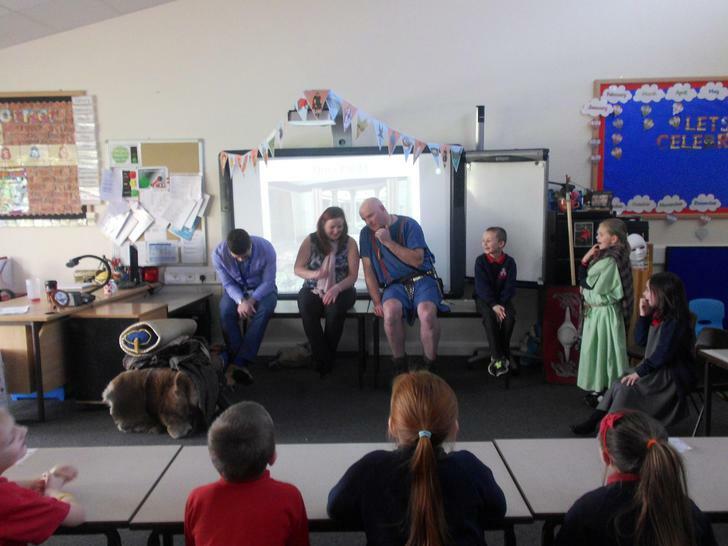 He also told us some gross facts about the Britons and Romans. 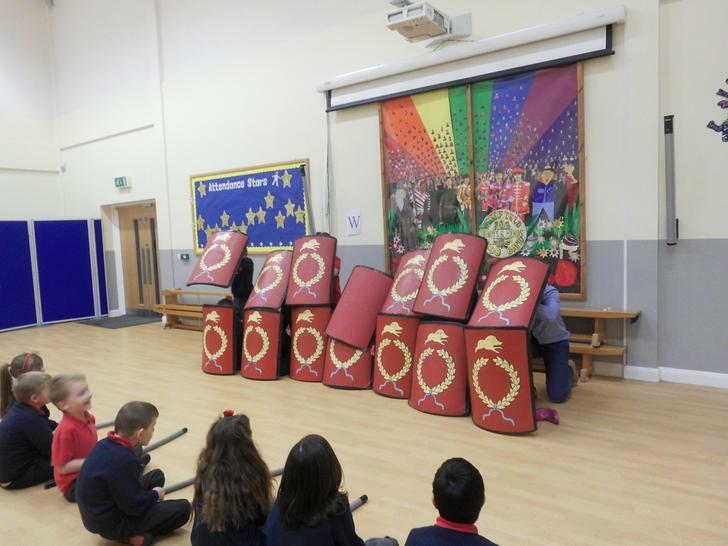 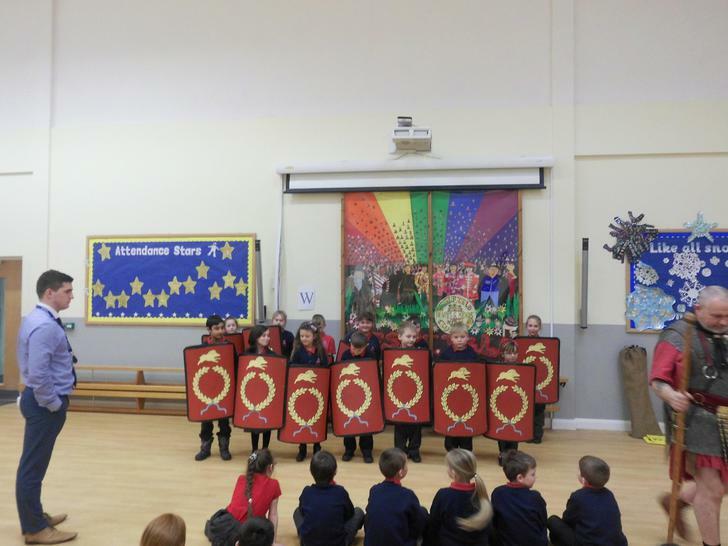 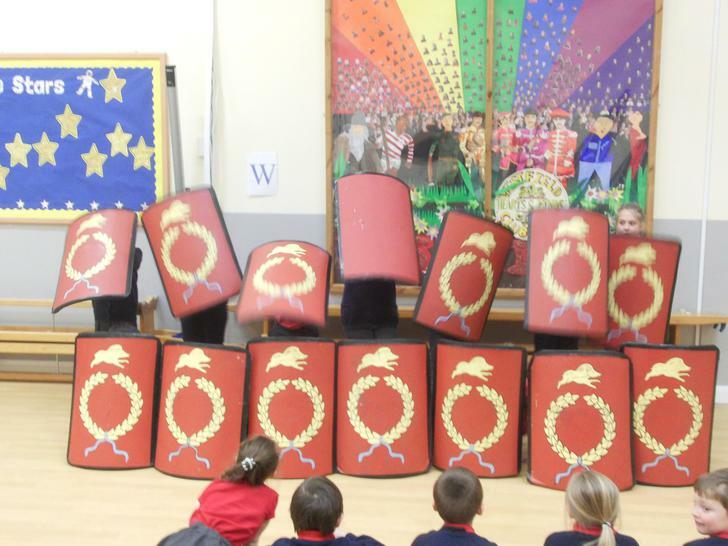 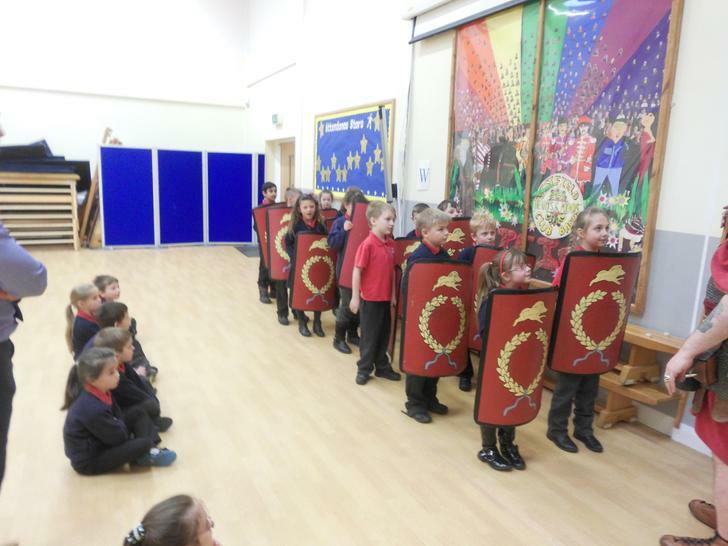 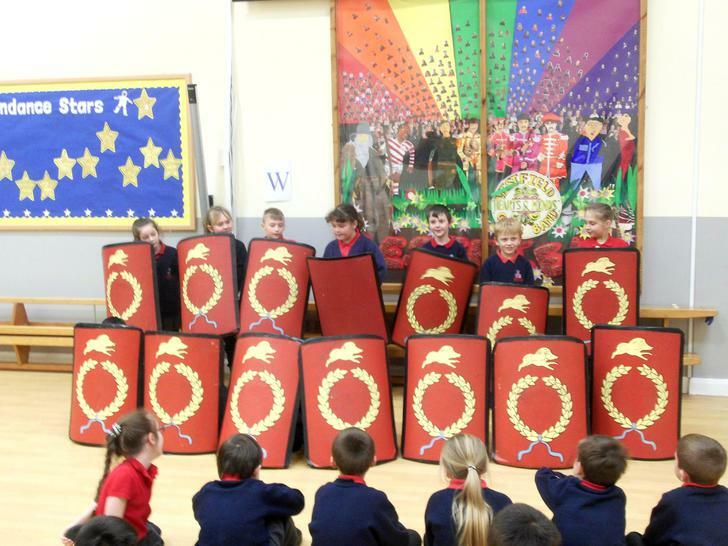 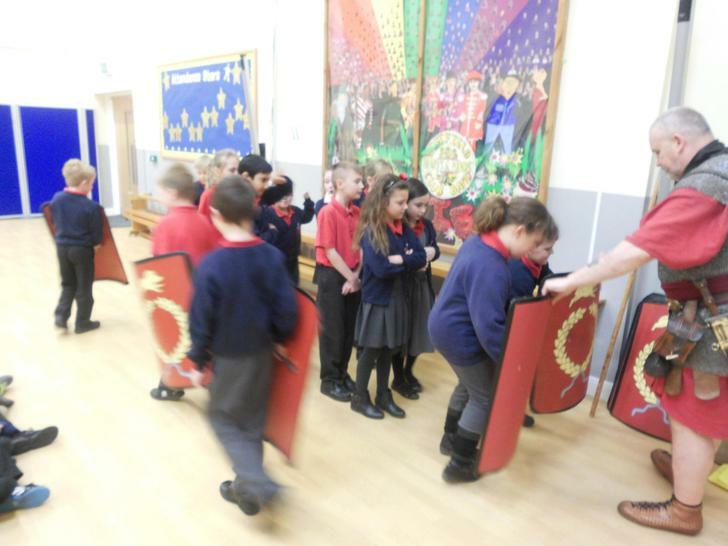 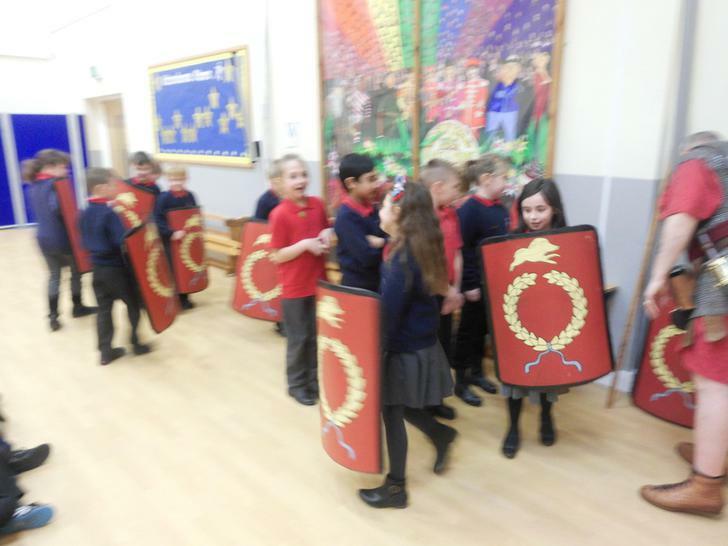 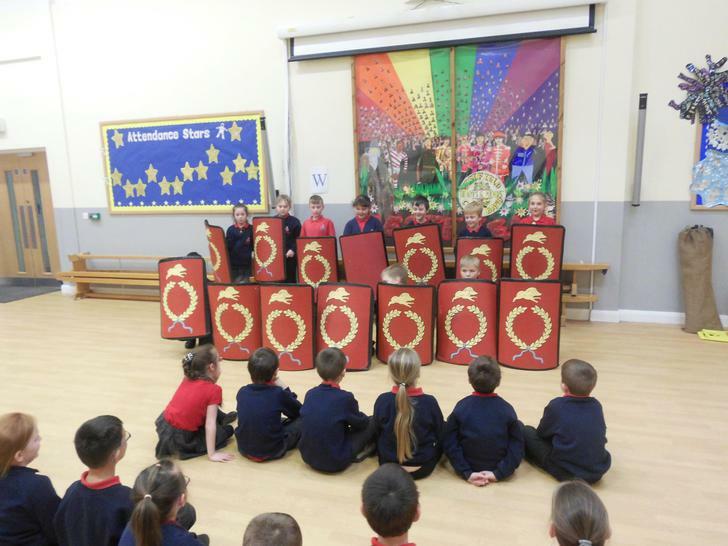 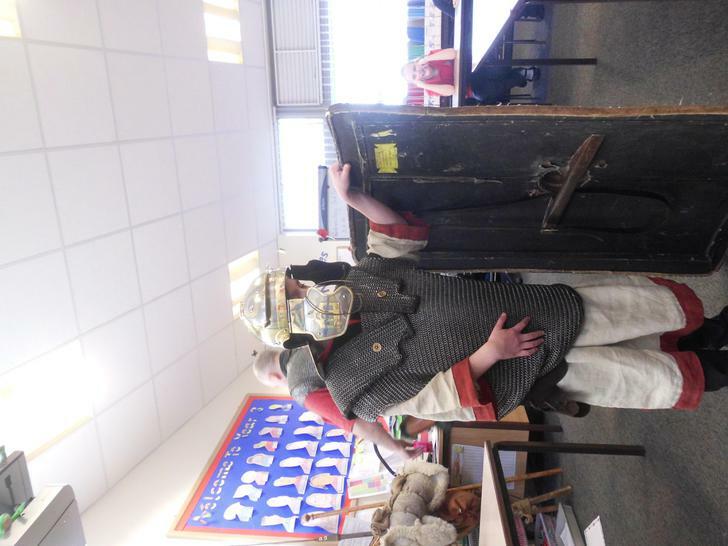 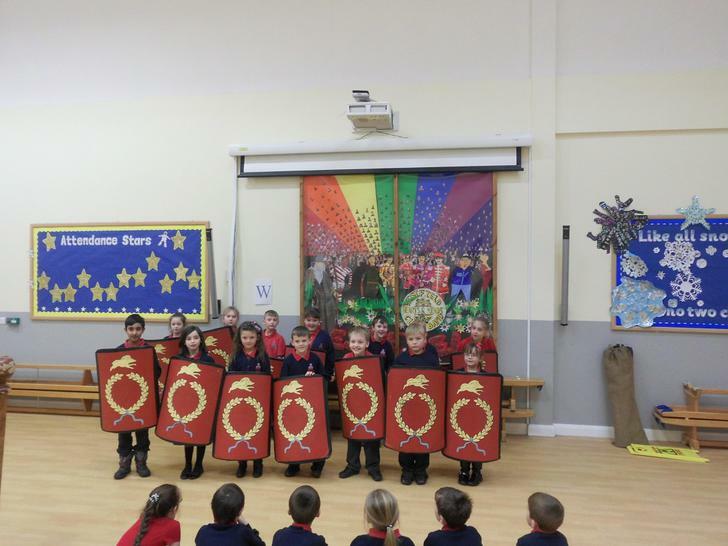 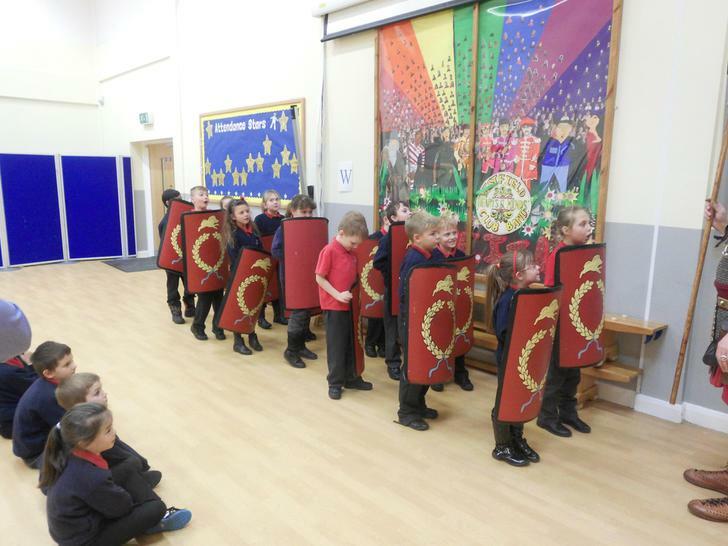 In the afternoon Kias the Roman Soldier taught us about the Roman army, later in the afternoon we pretended we were under attack and took cover behind our shields in the shape of a turtles shell. 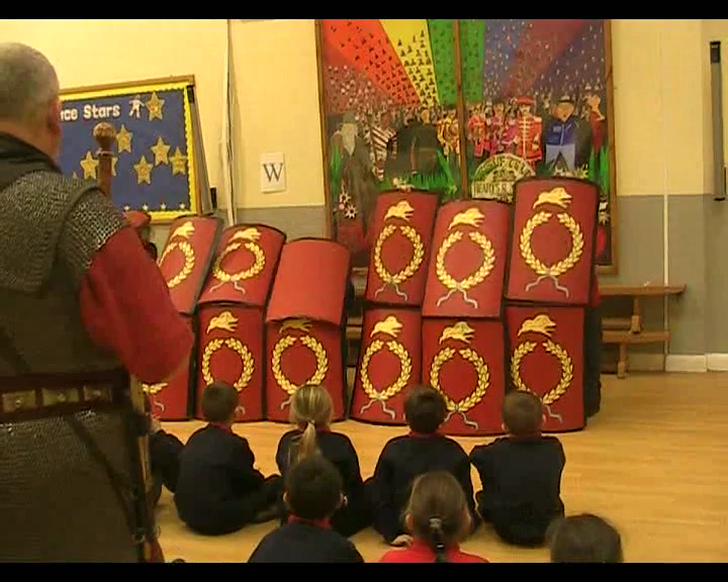 Have a watch of the video below to see!